The scope of this article is limited to the Pacific Ocean to the north of the equator between 100°E and 180th meridian. Within the northwestern Pacific Ocean, there are two separate agencies that assign names to tropical cyclones which can often result in a cyclone having two names. The Japan Meteorological Agency (JMA) will name a tropical cyclone should it be judged to have 10-minute sustained wind speeds of at least 65 km/h (40 mph) anywhere in the basin, whilst the Philippine Atmospheric, Geophysical and Astronomical Services Administration (PAGASA) assigns names to tropical cyclones which move into or form as a tropical depression in their area of responsibility located between 135°E and 115°E and between 5°N–25°N regardless of whether or not a tropical cyclone has already been given a name by the JMA. Tropical depressions that are monitored by the United States' Joint Typhoon Warning Center (JTWC) are given a number with a "W" suffix. During the year several national meteorological services and scientific agencies forecast how many tropical cyclones, tropical storms, and typhoons will form during a season and/or how many tropical cyclones will affect a particular country. These agencies included the Tropical Storm Risk (TSR) Consortium of the University College London, Philippine Atmospheric, Geophysical and Astronomical Services Administration (PAGASA) and the Taiwan's Central Weather Bureau. Some of the forecasts took into consideration what happened in previous seasons and the El Niño Conditions that were observed during the year. The first forecast of the year was released by PAGASA during January 2015, within its seasonal climate outlook for the period January – June. The outlook noted that one to two tropical cyclones were expected between January and March while one to three were expected to develop or enter the Philippine Area of Responsibility between April and June. During March the Hong Kong Observatory predicted that the typhoon season in Hong Kong, would be near normal with four to seven tropical cyclones passing within 500 km (310 mi) of the territory compared to an average of six. Within its Pacific ENSO Update for the 2nd quarter of 2015, NOAA's Pacific El Niño-Southern Oscillation Applications Climate Center, noted that the risk of a damaging tropical cyclone in Micronesia was "greatly enhanced" by El Niño. As a result, they forecasted that the risk of a typhoon severely affecting Micronesia was high, with most islands predicted to have a "1 in 3 chance" of serious effects from some combination of high winds, large waves and extreme rainfall from a typhoon. They also predicted that there was a near 100% chance of severe effects from a typhoon somewhere within Micronesia. On May 6, Tropical Storm Risk issued their first forecast for the season and predicted that the season, would be the most active since 2004 with activity forecast to be above average. Specifically it was forecast that 27 tropical storms, 17 typhoons, and 11 intense typhoons would occur, while an ACE Index of 400 was also forecasted. Ahead of the Thailand rainy season starting during May, the Thai Meteorological Department predicted that one or two tropical cyclones would move near Thailand during 2015. The first of the two tropical storms was predicted to pass near Upper Thailand in either August or September, while the other one was expected to move to the south of Southern Thailand during November. On June 30, Taiwan's Central Weather Bureau predicted that 28–32 tropical storms would develop over the basin, while two — four systems were expected to affect Taiwan itself. During July, Paul Stanko of the United States National Weather Service Weather Forecast Office in Tiyan, Guam, called for tropical cyclone activity to be above average. He also predicted that several records would be set for the number of major typhoons in the western Pacific, tropical storms, typhoons and major typhoons in Micronesia. PAGASA subsequently predicted within its July — December seasonal climate outlook, that seven to ten tropical cyclones were likely to develop and/or enter the Philippine area of responsibility between July and September, while three to five were predicted for the October–December period. On July 16, the Guy Carpenter Asia-Pacific Climate Impact Centre (GCACIC) and the City University of Hong Kong's School of Energy, released their seasonal forecast for the period between June 1 – November 30. They predicted that 19.9 tropical cyclones would develop during the period with 10.3 of these going on and making landfall compared to averages of 23.0 and 17.4 tropical cyclones. They further predicted that both the Korea — Japan region and that Taiwan and the Eastern Chinese provinces of Jiangsu, Shanghai, Zhejiang, Fujian would see three of these landfalls each. Vietnam, the Philippines and the Southern Chinese provinces of Guangdong, Guangxi and Hainan were forecasted to see four landfalling tropical cyclones. On August 5, Tropical Storm Risk issued their final forecast for the season and predicted that 2015 would be a hyperactive season. Specifically it was forecast that 30 tropical storms, 20 typhoons, 13 intense typhoons would occur, while an ACE Index of 448 was also forecasted. Most of the 27 tropical cyclones affected Micronesia, because of the strong 2014–16 El Niño event. 2015 opened with Tropical Depression Jangmi (Seniang) active within the Sulu Sea to the north of Malaysia. The system subsequently moved south-eastwards, made landfall on Malaysia, and dissipated later that day. However the official first tropical cyclone of the season was a minor tropical depression, in the same place where Jangmi persisted on January 2, but dissipated two days later. Tropical Storm Mekkhala, in January 13, developed and approached the Philippines where it caused minor damages and also notably interrupted Pope Francis's visit to the country. In early-February, Typhoon Higos developed further east of the basin and reached peak strength of a Category 4 typhoon. Higos became the strongest typhoon on record in the month of February when it broke the record of 1970's Typhoon Nancy, and was in turn surpassed by Typhoon Wutip in 2019. During the opening days of March 2015, a major westerly wind burst occurred, which subsequently contributed to the development of the 2014–16 El Nino event and Tropical Storm Bavi. Typhoon Maysak developed and became the most intense pre-April tropical cyclone on record, with a peak of 280 km/h (175 mph) 1-minute sustained winds and a minimum pressure of 910 mbar (26.87 inHg). Only one weak system (Haishen) formed on April and caused little to no damage. In May, two storms, Typhoons Noul and Dolphin, both reached Category 5 super typhoon intensity. Both typhoons affected landmasses and altogether caused about $37.1 million in damages, respectively. Kujira formed in June and made landfall in southeast Asia, bringing flooding. During the first week of July, the tropics rapidly became active, with a trio typhoons developing simultaneously and affecting three different landmasses. Total damages from Chan-hom, Linfa and Nangka nearly reached US$2 billion. 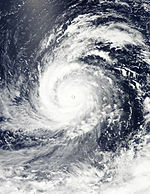 Afterwards, Typhoon Halola entered the basin from the Eastern Pacific. In August, Typhoon Soudelor made landfall in Taiwan and China, where it killed 38 people and damages totaled up to US$3.7 billion. Typhoon Goni badly affected the Philippines, the Ryukyu Islands and Kyushu as an intense typhoon, causing about US$293 million in damages. In September, Tropical Storm Etau brought flooding in much of Japan, with damages at least US$100 million. Tropical Storm Vamco made landfall over in Vietnam and caused moderate impact and damages. 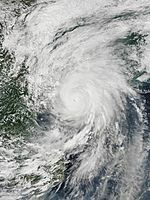 Typhoon Dujuan, similar to Soudelor, impacted China and Taiwan with total damages of $660 million as a Category 4 super typhoon. In early October, Typhoon Mujigae rapidly intensified into a Category 4 typhoon when it made landfall over Zhanjiang, spawning a tornado causing 29 deaths and over US$4 billion in damages. Later, Typhoon Koppu devastated the Philippines as a super typhoon, causing at least $230 million in damages and killing at least 55 people. Typhoon In-fa became a strong typhoon in November, causing minor impact over in the Caroline Islands. In December, Typhoon Melor maintained Category 4 intensity as it passed the Philippine Islands with 42 deaths and US$140 million in damages, while a tropical depression, named Onyok by PAGASA, made landfall in southern Philippines. The final tropical cyclone of the year developed near Malaysia on December 20, and dissipated three days later. Tropical Depression 01W developed during January 13, to the south of Chuuk State. Despite convection being displaced from its exposed low-level circulation center (LLCC), the JMA upgraded 01W to a tropical storm with the name Mekkhala, the first of the season. Later, the PAGASA had stated that Mekkhala had entered the Philippine Area of Responsibility, assigning it the local name Amang. By January 15, the JTWC upgraded Mekkhala to a tropical storm when spiral banding wrapped into a defined LLCC. Mekkhala intensified to a severe tropical storm when deep convection wrapped into its center during January 16. Satellite imagery revealed that a central dense overcast had obscured its center, therefore Mekkhala strengthened into a Category 1 typhoon by the JTWC. Operationally the JMA classified Mekkhala's peak as a typhoon on January 17, however in post-analysis Mekkhala reached its peak as a severe tropical storm. At the time when Mekkhala made landfall over in Eastern Samar, Visayas, land reaction persisted and the typhoon weakened to a tropical storm. By January 18, Mekkhala continued weakening as it started to "unravel and erode" as it passed through the Bicol region in Luzon. Both the JMA and the JTWC issued their final warning later that day. However, the JMA continued to monitor Mekkhala until it dissipated early on January 21. Mekkhala (Amang) had mostly minor impacts in the Philippines. The storm left 3 dead in total in Bicol region and caused about ₱318.7 million (US$7.13 million) in damages. Moreover, the storm caused agricultural damage of ₱30.3 million (US$678,000) in Samar, where it made landfall. Mekkhala also interrupted Pope Francis's visit to the Philippines on January 17. During February 6, the JMA started to monitor a tropical depression that had developed about 190 km (120 mi) to the northwest of Palikir in Pohnpei State. By January 7, the JTWC started issuing advisories while designating the system as 02W. Deep convection later deepened over in its LLCC and 02W intensified into a tropical storm, with the JMA naming it as Higos. Higos started to organize as it convection consolidated and its center became well-defined. The JMA upgraded Higos to a severe tropical storm thereafter. With multiple curved bands wrapping to its center, Higos strengthened into a Category 1 typhoon. The JMA upgraded Higos to a typhoon early on February 9. Higos explosively intensified through the course of 24 hours and on February 10, Higos reached its peak intensity with 1-minute sustained winds of 240 km/h (150 mph), making it the first super typhoon of the season. Later, Higos rapidly weakened; its eye dissipated and convection became less organized, so the JMA downgraded Higos to a severe tropical storm. By February 11, Higos further weakened to a tropical storm as its center became fully exposed. Both agencies issued their final warning later that day and Higos fully dissipated on February 12. 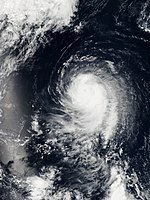 Tropical Storm Bavi was first noted as a tropical disturbance during March 8, while it was located 500 km (310 mi) to the southeast of Kwajalein Atoll in the Marshall Islands. Over the next few days the system moved north-westwards through the Marshall Islands, and was classified as a tropical depression during March 10. The system continued to develop over the next day as it moved north-westwards, before it was classified as a tropical storm and named Bavi by the JMA. The system subsequently continued to gradually intensify as it moved westwards, around the southern periphery of the subtropical ridge of high pressure located to the northwest of the system. During March 14, the system peaked as a tropical storm with the JMA reporting 10-minute sustained winds of 85 km/h (50 mph), while the JTWC reported 1-minute sustained winds of 95 km/h (60 mph). As the system subsequently started to weaken the system's low level circulation passed over Guam during March 15, while convection associated with the system passed over the Northern Mariana islands. Over the next couple of days the system moved westwards and continued to weaken, before it weakened into a tropical depression during March 17, as it moved into the Philippine area of responsibility, where it was named Betty by PAGASA. The JTWC stopped monitoring Bavi during March 19, after the system had weakened into a tropical disturbance, however, the JMA continued to monitor the system as a tropical depression, until it dissipated during March 21. Bavi and its precursor tropical disturbance impacted eastern Micronesia, with strong to gale-force winds of between 45–65 km/h (30–40 mph), reported on various atolls in the Marshall Islands. Considerable damage was reported on the islet of Ebeye while on the main atoll of Kwajalein, a small amount of tree damage was reported and several old steel structures were made too dangerous to use. Overall damages in the Marshall Islands were estimated at over US$2 million, while a fishing vessel and its crew of nine were reported missing during March 12. After impacting Eastern Micronesia, Bavi approached the Mariana Islands, with its circulation passing over Guam during March 15, where it caused the highest waves to be recorded on the island in a decade. Bavi also impacted the Northern Mariana Islands of Rota, Tinian and Saipan, where power outages were reported and five houses were destroyed. Total property damages within the Mariana Islands, were estimated at around US$150 thousand. A day after Bavi dissipated, a low-pressure area formed southwest of the Marshall Islands. It slowly drifted northwestward and became more organized over the next two days. The next day, the JMA started tracking the system as a tropical depression. On March 27, the JTWC started tracking the system as a tropical depression, and designated it 04W. Moving west-northwestward, the system's center became more consolidated with convective banding becoming wrapped into it. The JTWC upgraded 04W to a tropical storm the same day. The JMA followed suit later that day, when it was named Maysak. On March 28, Maysak developed an eye, and the JMA further upgraded it to a severe tropical storm. The eye became more well defined with deep convection persisting along the southern quadrant of the storm. The overcast became more consolidated, as the JMA upgraded Maysak to a typhoon on the same day. On March 29, Maysak rapidly intensified over a period of 6 hours, attaining 1-min maximum sustained winds of 230 km/h (145 mph), making it a Category 4 equivalent on the SSHWS. On the next day, Maysak further intensified into a Category 5-equivalent super typhoon. On April 1, the PAGASA stated tracking on the system, naming it as Chedeng. Typhoon Chedeng (Maysak) weakened more and eventually dissipated in the Luzon landmass. The remnants of Maysak eventually made it to the South China Sea. Typhoon Maysak passed directly over Chuuk State in the Federated States of Micronesia on March 29, causing extensive damage. High winds, measured up to 114 km/h (71 mph) at the local National Weather Service office, downed numerous trees, power lines, and tore off roofs. An estimated 80–90 percent of homes in Chuuk sustained damage. Power to most of the island was knocked out and communication was difficult. Early reports indicated that five people had lost their lives. By March 29, the JTWC started to monitor a tropical disturbance over the Marshall Islands, and later upgraded it to a "low chance" of being a cyclone two days later. Best track indicated that the system developed into a tropical depression during April 2, but operationally the JMA did so in April 3. Shortly thereafter, the JTWC designated the system to 05W, when 1-minute winds stated that it had strengthened into a tropical depression. 05W started to organize with a slight consolidation of its LLCC and some convective banding; the JTWC upgraded 05W to a tropical storm. The JMA did the same later, when it was given the name Haishen. Haishen remained at low-level tropical storm strength until its center became fully exposed with its deepest convection deteriorating due to wind shear. Both the JMA and JTWC stopped monitoring the system during April 6, as it dissipated over open waters to the southeast of the Mariana Islands. In Pohnpei State, 118 mm (4.66 in) worth of rain was recorded on the main island between April 2–3, however, there was no significant damage reported in the state. During April 4, the system passed to the north of Chuuk and Fananu in Chuuk State, while wind and rain associated with Haishen passed over the area. There were no direct measurements, of either the wind or rainfall made on Fananu, however, it was estimated that tropical storm force winds of 40–52 mph (64–84 km/h) were experienced on the island. It was also estimated that 100–150 mm (4–6 in) of rainfall fell on the island, while islanders confirmed that periods of heavy rain did occur. Haishen knocked down several fruit trees on Fananu, while the heavy rains were considered to be a positive blessing, as they restored water levels on the island, that had been damaged a few days earlier by Maysak. There were no reports of any other significant damage in the state, while property and crop damage were both estimated at US$100 thousand. On April 30, a tropical disturbance developed near Chuuk. On May 2, the JMA began to track the system as a weak tropical depression. The following day, the JMA upgraded the depression to a tropical storm and assigned the name Noul. On May 5, the JMA upgraded the system to a severe tropical storm while the JTWC upgraded it to a minimal typhoon. The following day, the JMA also upgraded Noul to a typhoon. Early on May 7, Noul entered the Philippine Area of Responsibility and was assigned the name Dodong by PAGASA. Later that day, the JTWC upgraded Noul to a Category 3 typhoon as a small eye had developed. At the same time, according to Jeff Masters of Weather Underground, Noul had taken on annular characteristics. Although Noul weakened to a Category 2 typhoon early on May 9, six hours later, the JTWC upgraded Noul back to a Category 3 typhoon, as its eye became clearer and well-defined. The JTWC upgraded Noul to a Category 4 super typhoon later that day after it began rapid deepening. On May 10, the JTWC further upgraded Noul to a Category 5 super typhoon, and the JMA assessed Noul with 10-minute sustained winds of 205 km/h (125 mph) and a minimum pressure of 920 mbar, its peak intensity. Later that day, Noul made landfall on Pananapan Point, Santa Ana, Cagayan. After making a direct hit on the northeastern tip of Luzon, the storm began to weaken, and the JTWC downgraded it to a Category 4 super typhoon. Subsequently, it began rapidly weakening and by May 12, it had weakened to a severe tropical storm. On May 3, a tropical disturbance south southeast of Pohnpei began to organize, and the JMA upgraded the disturbance into a tropical depression. Late on May 6, the JTWC started issuing advisories and designated it as 07W. 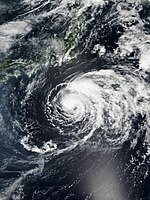 On May 9, the JMA upgraded the depression into a tropical storm and named it Dolphin. The JMA further upgraded Dolphin to a severe tropical storm on May 12, and on the following day, the JTWC upgraded Dolphin to a typhoon. Six hours later, the JMA had followed suit. Over the next few days, Dolphin continued to intensify until it reached Category 5 super typhoon status on May 16. It weakened into a category 4 super typhoon 12 hours later, until it weakened into a category 4 equivalent typhoon after maintaining super typhoon status for 30 hours. Dolphin weakened further into a severe tropical storm on May 19, as the JTWC downgraded Dolphin into a tropical storm and issued their final warning. On May 20, the JMA issued their final warning, and the JTWC and the JMA declared that Dolphin had become an extratropical cyclone. 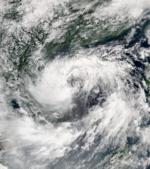 During June 19 the JMA started to monitor a tropical depression that had developed within the South China Sea about 940 km (585 mi) to the southeast of Hanoi, Vietnam. Over the next day the system gradually developed further before the JTWC initiated advisories on the system and designated it as Tropical Depression 08W. Deep convection obscured its low-level circulation center; however, upper level analysis indicated that 08W was in an area of moderate vertical windshear. On June 21, the JMA had reported that 08W had intensified into a tropical storm, naming it Kujira. Kujira slightly intensified and the JTWC finally upgraded the system to a tropical storm by June 22. In the same time, Kujira's circulation became exposed but convection remained stable. Therefore, according to both agencies, Kujira reached its peak intensity with a minimum pressure of 985 mbar later in the same day. Kujira would've been a severe tropical storm but because of displaced convection and moderate to high windshear, the storm began a weakening trend. The JTWC downgraded Kujira to a tropical storm as it was located in an area of very unfavorable environments early on June 23; however, by their next advisory it was reported that Kujira entered an area of warm waters and was upgraded back to tropical storm status. 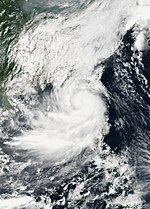 During June 24, Kujira made landfall on Vietnam to the east of Hanoi and weakened into a tropical depression. The system was subsequently last noted during the next day, as it dissipated to the north of Hanoi. Although outside the Philippine area of responsibility, Kujira's circulation enhanced the southwest monsoon and marked the beginning of the nation's rainy season on June 23, 2015. Striking Hainan on June 20, Kujira produced torrential rain across the island with an average of 102 mm (4.0 in) falling across the province on June 20; accumulations peaked at 732 mm (28.8 in). The ensuing floods affected 7,400 hectares (18,300 acres) of crops and left ¥85 million (US$13.7 million) in economic losses. Flooding in northern Vietnam killed at least nine people, including eight in Sơn La Province, and left six others missing. Across the country, 70 homes were destroyed while a further 382 were damaged. Preliminary estimated damage in Vietnam were at ₫50 billion (US$2.28 million). On June 25, the JTWC started to monitor a weak tropical disturbance embedded in the active ITCZ. Convection increased within the system as the JMA and the JTWC upgraded the system to a tropical depression on June 30 while it was located near the island of Kosrae. Later that day, the JMA upgraded the depression to a tropical storm and assigned the name Chan-hom. Although it was upgraded to a typhoon on July 1, increasing wind shear caused the system to weaken back into a tropical storm as it neared Guam. On July 5, as it started to move north then northwest, Chan-hom showed good outflow aloft and low vertical windshear was within the area. Both agencies upgraded the storm to a typhoon again on July 6, as an eye developed. On July 7, PAGASA had reported that Chan-hom had entered their Area of Responsibility and was assigned the name Falcon. With a clear and defined eye and an expanding gale-force winds, both agencies classified Chan-hom as a Category 4 typhoon on July 9, with a 10-minute wind peak of 165 km/h (105 mph) and a minimum pressure of 935 millibars. On July 10, Chan-hom further weakened as an eyewall replacement cycle developed with moderate to high vertical windshear as it neared eastern China. Chan-hom made landfall southeast of Shanghai later that day. Because of cooler waters, Chan-hom weakened below typhoon status. During July 12, Chan-hom briefly transitioned into an extratropical cyclone, before it dissipated over North Korea during the next day. Ahead of the typhoon's arrival in East China, officials evacuated over 1.1 million people. Total economic losses in Zhejiang amounted to ¥5.86 billion (US$943 million). Even though Chan-hom didn't affect the Philippines, the typhoon enhanced the southwest monsoon which killed about 16 people and damages of about ₱3.9 million (US$86,000). Just as soon as the tropics began to activate, the Intertropical Convergence Zone span four tropical systems across the Western Pacific, and a tropical disturbance had formed about 1015 km (882 mi) east-southeast of Manila during June 30. By July 1, the JMA started to track the system as it was classified as a tropical depression. During the next day, the JTWC followed suit and assigned the designation of 10W, while PAGASA named 10W as Egay. Few hours later, Egay strengthened into a tropical storm, with the name Linfa given from the JMA. Despite an exposed center, associated convection was being enhanced by its outflow, and Linfa intensified into a severe tropical storm. Late on July 4, Linfa made landfall over in Palanan, Isabela while maintaining its intensity. Linfa crossed the island of Luzon and emerged to the South China Sea while it began moving in a north-northwestward direction. By July 7, Linfa had become slightly better organized. PAGASA issued its final bulletin on Linfa (Egay) as it exited their area of responsibility. Linfa entered in an area of favorable environments with good banding wrapping into its overall structure, and Linfa strengthened into a Category 1 typhoon by the JTWC as an eye developed and tightly curved banding started to wrap its LLCC. During July 9, Linfa made landfall in Guangdong province of China. Thereafter, Linfa experienced land interaction and rapidly weakened and both agencies issued their final advisories on July 10. Across Luzon, Linfa damaged 198 houses and destroyed another seven. The storm damaged ₱34 million (US$753,000) worth of crops, and total damage reached ₱214.65 million (US$4.76 million). Most of the power outages were repaired within a few days of Linfa's passage. According to estimates in southern China, economic losses from the storm reached ¥1.74 billion (US$280 million). A total of 288 homes collapsed and 56,000 people were displaced. A gust of 171 km/h (106 mph) was observed in Jieyang. A storm surge of 0.48 m (1.6 ft) was also reported along Waglan Island and rainfall reached a total of around 40 mm (1.6 in) in the territory. On July 3, the JMA started to monitor a tropical depression over the Marshall Islands. Later that day, was designated as 11W by the JTWC as it started to intensify. The JMA followed suit of upgrading it to a tropical storm, naming it Nangka. After three days of slow strengthening, Nangka was upgraded to a severe tropical storm on July 6, because of favorable environments such as a symmetrical cyclone, an improving outflow and low vertical windshear . Shortly afterwards, rapid intensification ensued and Nangka was upgraded to a Category 2 typhoon 24 hours later. The intensification trend continued, and Nangka reached its first peak as a Category 4 typhoon as an eye developed. Shortly after its first peak, Nangka slightly weakened and its eye became cloud-filled. Although some vertical wind shear initially halted the intensification trend, the storm resumed intensifying on July 9, and was upgraded to a Category 4 super typhoon with 1-minute sustained winds of 250 km/h (155 mph). In the same time, Nangka's structure became symmetrical and its eye re-developed clearly. The JMA also assessed Nangka's peak with 10-minute winds of 185 km/h (115 mph). Nangka maintained super typhoon strength for 24 hours before weakening to a typhoon on July 10 as it entered an area of some unfavorable environments. Nangka weakened to a Category 1-equivalent typhoon on July 11, but began strengthening again late on July 12, reaching a secondary peak as a Category 3-equivalent typhoon as its eye became clear once more. An eyewall replacement cycle interrupted the intensification the following day, and Nangka weakened because of drier air from the north. At around 14:00 UTC on July 16, Nangka made landfall over Muroto, Kōchi of Japan. A few hours later, Nangka made its second landfall over the island of Honshu, as the JMA downgraded Nangka's intensity to a severe tropical storm. Because of land reaction and cooler waters, Nangka's circulation began to deteriorate and was downgraded to a tropical depression by both agencies late on July 17. On July 18, both agencies issued their final warning on Nangka as it weakened to a remnant low. On Majuro atoll in the Marshall Islands, high winds from Nangka tore roofs from homes and downed trees and power lines. Nearly half of the nation's capital city of the same name were left without power. Tony deBrum, the Marshall Island's foreign minister, stated "Majuro [is] like a war zone." At least 25 vessels in the island's lagoon broke loose from or were dragged by their moorings. Some coastal flooding was also noted. 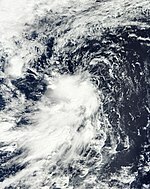 During July 13, Tropical Storm Halola moved into the Western Pacific basin from the Central Pacific basin, and was immediately classified as a severe tropical storm by the JMA. Over the next day the system moved westwards and gradually intensified, before it was classified as a typhoon during the next day. Later that day, both the JMA and JTWC reported that Halola reached peak intensity as a Category 2 typhoon. However weakening convection and moderate vertical windshear caused the typhoon to weaken on July 15. Halola further weakened to a tropical depression as the JMA issued its final advisory on July 18; however, the JTWC continued tracking Halola. On July 19, the JMA re-issued advisories and Halola showed signs of further intensification. An improved convective signature, expanding moisture field and shallow banding wrapped into the system prompted both agencies to upgrade it to a tropical storm early on July 20. Halola intensified into a typhoon again the next day, as the typhoon became more symmetrical than before. By July 22, Halola reached its second peak intensity as a Category 2 typhoon, but this time it was a little stronger with 10-minute sustained winds of 150 km/h (90 mph). PAGASA reported that Halola entered their Area of Responsibility receiving the name Goring early on July 23. On the next day, Halola encountered northeasterly vertical windshear as the system started to weaken. 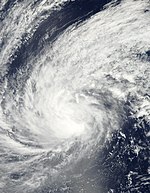 During July 25 and 26, Halola weakened to tropical storm strength and passed the southwestern Japanese Islands. At around 09:30 UTC on July 26, Halola made landfall over Saikai, Nagasaki of Japan. The system was subsequently last noted later that day as it dissipated in the Sea of Japan. Throughout the Daitō Islands, sugarcane farms were significantly affected by Typhoon Halola, resulting damage of about ¥154 million (US$1.24 million). During July 23, the JMA and JTWC started monitoring Tropical Depression 12W, that had developed to the northeast of Manila, Philippines. Over the next day the system moved towards the north-northeast along the subtropical ridge, in an environment that was considered marginal for further development. During the next day, despite Dvorak estimates from various agencies decreasing because of a lack on convection surrounding the system, the JTWC reported that the system had become a tropical storm, with peak 1-minute sustained winds of 65 km/h (40 mph). This was based on an image from the advanced scatterometer, which showed winds of 65–75 km/h (40–45 mph) along the system's western periphery. The system subsequently directly interacted with Typhoon Halola, before increased vertical wind shear and subsidence from the interaction caused the depression to deteriorate. As a result, the system's low level circulation became weak and fully exposed, with deep convection displaced to the system's western half, before it was last noted during July 25, as it dissipated to the east of Taiwan. During July 29, the JMA reported that a tropical depression had developed, about 1,800 km (1,120 mi) to the east of Hagåtña on the island of Guam. Over the next day the system moved westwards under the influence of the subtropical ridge of high pressure and quickly consolidated, in an environment that was marginally favorable for further development. As a result, the JTWC initiated advisories and designated it as Tropical Depression 13W during July 30. In the same day, Soudelor showed signs of rapid intensification as a central dense overcast obscured its LLCC. Therefore, the JMA upgraded Soudelor to a severe tropical storm on August 1. Intensification continued, and both agencies upgraded Soudelor to a typhoon the next day. On August 3, Soudelor further deepened into a Category 5 super typhoon with 285 km/h (180 mph) 1-minute sustained winds, and the JMA assessed Soudelor with 10-minute sustained winds of 215 km/h (130 mph) and a minimum central pressure of 900 millibars, making Soudelor the strongest typhoon since Typhoon Vongfong at the time. The typhoon maintained its peak intensity for 18 hours until it began to weaken gradually on 15:00 UTC on August 4. The next day, PAGASA noted that Soudelor had entered the Philippine area of responsibility, naming it Hanna. 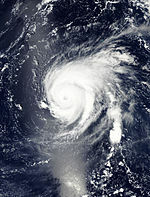 On August 7, Soudelor re-intensified into a Category 3-equivalent typhoon as it entered an area of favorable conditions. On August 2, Soudelor made landfall on Saipan as a Category 4 typhoon resulting in severe damage, with early estimates of over $20 million (2015 USD) in damages. On August 8, at around 4:40 AM, Soudelor made landfall to the north of Hualien as a Category 3 storm. During August 1, the JMA reported that a tropical depression had developed, about 940 km (585 mi) to the southeast of Tokyo, Japan. The system had a small low level circulation center, which was partially exposed, with deep atmospheric convection located over the systems southern quadrant. Overall the disturbance was located within a favourable envioroment for further development, with favourable sea surface temperatures and an anticyclone located over the system. During the next day, the system was classified as Tropical Depression 14W by the JTWC, while it was located about 740 km (460 mi) to the southeast of Yokosuka, Japan. Because of a well-defined but an exposed low-level circulation center with deep flaring convection over the storm's eastern periphery, the JTWC upgraded the system to a tropical depression, designating it as 14W. The JTWC issued its final warning on the system during August 4, after an image from the advanced scatterometer showed that 14W had a weak circulation that had fallen below their warning criteria. However, the JMA continued to monitor the system, before it was last noted during the next day while it was affecting Kansai region. During August 6, the JMA started to monitor a tropical depression that had developed about 680 km (425 mi) to the northeast of Hagåtña, Guam. The system was located within an area that was considered moderately favorable for further development, with low to moderate vertical windshear and a good outflow. Over the next day, convection wrapped around the system's low-level circulation and the system gradually consolidated, before a tropical cyclone formation alert was issued by the JTWC later during that day. Early on August 7, the JTWC upgraded the system to Tropical Depression 15W. On the same day, 15W gradually intensified, and was named Molave by the JMA. The JTWC kept Molave's intensity to a weak tropical depression of 25 knots because of poorly and exposed circulation. However the JTWC upgraded Molave to a tropical storm on August 8, as deep convection and tropical storm force winds were reported in the northwestern side of the system. During the next day, Molave entered in an area of marginally favorable conditions with low to moderate vertical wind shear, with its circulation becoming partially exposed. Hours later, deep convection rapidly diminished and the JTWC declared it to be a subtropical storm and issued its final advisory. Despite weakening to a subtropical storm, the JMA still classified Molave at tropical storm strength. On August 11, according to the JTWC, strengthened back into a tropical storm and re-issued advisories. Molave's convection weakened due to strong shear as its LLCC became fully exposed. Later that day, Molave weakened to minimum tropical storm strength. On August 13, deep convective was fully sheared and Molave drifted deeper into the mid-latitude westerlies. The JTWC later issued its final warning as environmental analysis revealed that Molave is now a cold-core extratropical system. 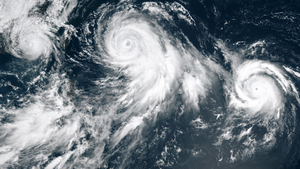 Early on August 14, the system degenerated into an extratropical cyclone, before it was last noted by the JMA moving out of the Western Pacific during August 18. On August 13, the JMA started to monitor a tropical depression that had developed, about 685 km (425 mi) to the southeast of Hagåtña, Guam. By the next day, the depression started to organize and was designated as 16W by the JTWC. Several hours later, deep convection had improved and has covered its LLCC and both agencies upgraded 16W to a tropical storm, naming it Goni. During the night of August 15, the JMA upgraded Goni to a severe tropical storm as windshear started to calm whilst deep convective banding wrapping into its circulation. By the next day, satellite imagery depicted a developing eye with an improved tightly curved banding which upper-level analysis revealed that low shear and an improving environment. Goni intensified into a typhoon by both agencies a few hours later. Early on August 17, satellite imagery depicted a small-pinhole eye as Goni underwent rapid intensification and was upgraded rapidly to a Category 4 typhoon and reached its first peak intensity. Slightly thinning convective banding and low to moderate wind shear caused Goni to weaken to a Category 3 typhoon. Goni maintained that intensity while moving westward and entered the Philippine's area which PAGASA gave the name Ineng, until on August 19, Goni entered an area of favorable environments. Goni had maintained an overall convective signature with tightly curved banding wrapping into a 28 nautical-mile eye. The JTWC later re-upgraded Goni back at Category 4 typhoon status early on August 20 as it neared the northeastern Philippine coast. Shortly after beginning to track the precursor to Goni, the JTWC started to track another tropical disturbance approximately 157 km (100 mi) north-northwest of Wotje Atoll in the Marshall Islands. Deep convection with formative bands surrounding the system's circulation caused both the JMA and the JTWC to upgrade it to a tropical depression, also designating it as 17W on August 14. 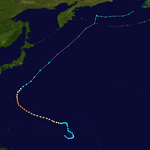 Later that day, both agencies upgraded 17W to a tropical storm, with the JMA naming it Atsani. On August 16, both agencies upgraded Atsani to a typhoon as it was found in microwave imagery that an eye was developing. Improved convective banding and a ragged eye formed by early the next day. That night, the typhoon's eye became well-defined and the JTWC assessed Atsani's intensity an equivalent to a Category 3 storm. Deepening of convection continued until early on August 18, when the JTWC upgraded Atsani to a Category 4 typhoon. By August 19, very low vertical windshear and excellent radial outflow were in place. A symmetric core and extra feeder bands prompted the JTWC to upgrade it to a super typhoon. Later that day, satellite imagery showed that Atsani was more symmetric and deep with feeder bands wrapping tighter into an expanded 34 nautical-mile diameter eye. Therefore, the JTWC upgraded Atsani further to a Category 5 super typhoon and it attained its peak intensity of 1-minute sustained winds of 260 km/h (160 mph). Atsani moved in a northwestward direction as it was later downgraded to a Category 4 super typhoon intensity on August 20 and at typhoon category later that day as it weakened further. On August 21, satellite imagery indicated that convection over Atsani was decreasing and an eyewall replacement cycle occurred, therefore, the JTWC downgraded Atsani further to a Category 3 typhoon. Vertical windshear started to intensify to a moderate scale and dry air persisted within the north and western part of Atsani and its eyewall began to erode. By the next day, significant dry air prohibited intensification and multispectural satellite imagery indicated a warming in the typhoon's cloud tops prompted the JTWC to downgrade it to a Category 1 typhoon. Atsani maintained that intensity as it started to move in a northeastward direction and began to interact with higher vertical wind shear associated by the mid-latitude baroclinic zone late on August 23. On August 24, both the JMA downgraded Atsani to a severe tropical storm. A few hours later, the JTWC followed suit of downgrading the typhoon to tropical storm strength. 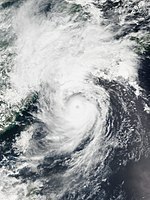 The JTWC issued its final warning later that day; During August 25, Atsani became an extra-tropical cyclone, while it was located about 1,650 km (1,025 mi) to the northeast of Tokyo, Japan. The system was subsequently last noted as it dissipated during August 27. 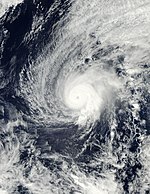 During September 1, Hurricane Kilo moved into the basin from the Central Pacific and was immediately classified as a typhoon by the JMA and the JTWC. During the next day, Kilo started to encounter moderate vertical wind shear and started weakening. After briefly re-strengthening, by September 4, moderate to high southwesterly wind shear prohibited development. Later that day, Kilo developed an eye again; however, the typhoon maintained its same intensity, and later became ragged on September 6. On September 7, the JTWC estimated winds of 165 km/h (105 mph), which again made its wind equal to that of Category 2 hurricane for a brief time. Later that day, Kilo started to weaken as its eye became irregular with eroding convection over the southern semi-circle of the typhoon. Deep convection started to decay, as the JTWC reported a few hours later. Late on the next day, the Kilo's convective signature began to degrade due to drier air wrapping to its core, forcing the JTWC to lower Kilo's intensity. On September 9, the JMA downgraded Kilo to a severe tropical storm. The JTWC followed suit several hours later as the center became exposed from the deep convection; Kilo was located in an area of strong shear. Thereafter, Kilo began to undergo extratropical transition as the JTWC issued its final warning early on September 11. Hours later, the JMA reported that Kilo had transitioned into an extratropical cyclone. The extratropical remnants of Kilo later affected the Kamchatka Peninsula and the Aleutian Islands. The system moved out of the basin on September 13 and was last noted over Alaska roughly two days later. On September 2, a tropical disturbance developed 560 km (350 mi) to the northwest of the island of Guam. Moving towards the northwest, post-analysis from the JMA showed that Etau formed early on September 6. The following day, the JMA upgraded the depression to a tropical storm while the JTWC upped it to a tropical depression following an increase in organization. Satellite image revealed that convection was increasing in coverage, causing the JTWC to upgrade it to a tropical storm. A banding eye feature developed on September 8, and therefore the JMA upgraded Etau to a severe tropical storm. Despite strong wind shear due to a trough, Etau maintained its intensity. Late on the same day, following an increase in convection, the JTWC assessed Etau's intensity to 55 knots. Early on September 9, Etau made landfall over central Honshu and in the same time, Etau weakened to tropical storm strength whilst the JTWC issued its final advisory. The JMA finally issued its final bulletin on Etau later that day once extratropical transition was completed. The remnants of Etau was absorbed by another extratropical system that was formerly Typhoon Kilo on September 11. When Etau affected Japan, particularly Honshu, during September 8–9, the storm brought widespread flooding. Record rains fell across many areas in eastern Japan, with more than 12 in (300 mm) reported in much of eastern Honshu. The heaviest rains fell across Tochigi Prefecture where 668 mm (26.3 in) was observed in Nikkō, including 551 mm (21.7 in) in 24 hours. Fukushima Prefecture saw its heaviest rains in 50 years, with more than 300 mm (12 in) observed during a 48‑hour span. Nearly 3 million people were forced to leave their homes. In total, eight people were killed and total damages were amounted to ¥11.7 billion (US$97.8 million). On September 10, the remnants of Etau brought some rainfall and gusty winds over in the Russian Far East region. On September 10, a tropical disturbance formed within the monsoon 560 km (350 mi) west of Manila. The disturbance meandered for a few days and was later classified as a tropical depression by the JMA on September 13. With flaring deep convection surrounding the center, the JTWC upgraded it to a tropical depression. Shortly after that, both the JMA and the JTWC upgraded it to a tropical storm. Due to increased wind shear, the center of Vamco became partially exposed on September 14. Therefore, the JTWC issued its final warning. The JMA later downgraded Vamco to a tropical depression and issued their final advisory early on September 15. The remnants of Vamco continued to move in a westward direction inland and crossed the 100th meridian east on September 16. Vamco made landfall south of Da Nang, Vietnam, which caused floods across parts of the country. Flooding in Vietnam killed 11 people. Losses to fisheries in the Lý Sơn District exceeded ₫1 billion (US$44,500). Damage to the power grid in Vietnam reached ₫4.9 billion (US$218,000). In Quảng Nam Province, Vamco caused moderate damage. In Duy Xuyên District, agricultural losses exceeded ₫2 billion (US$89,000) and in Nông Sơn District total damage is ₫1 billion (US$44,500). Officials in Thanh Hóa Province estimated total damages from the flooding by the storm had reached ₫287 billion (US$12.8 million). Flooding in Cambodia affected thousands of residents and prompted numerous evacuations. The remnants of Vamco triggered flooding in 15 provinces across Thailand and killed two people. At least 480 homes were damaged and losses exceeded ฿20 million (US$561,000). Two fishermen died after their boat sank during the storm off the Ban Laem District while a third remains missing. At the same time when Tropical Storm Vamco was named, another tropical disturbance was monitored by both the JMA and JTWC about 806 km (500 mi) east of Andersen Air Force Base. The JTWC issued a TCFA on the system later that day. On September 14, the JTWC upgraded the system to a tropical depression, designating it as 20W. Due to an increase of deep convection near the center, both agencies upgraded 20W to Tropical storm Krovanh by the next day. On September 16, Krovanh showed signs of increasing organization. Based on this, the JMA upgraded Krovanh to a severe tropical storm. Late on the same day, microwave imagery showed tightly-curved bands wrapping into a well-defined microwave eye; subsequently, both agencies upgraded Krovanh to typhoon status. Embedded in an area of very favorable environment with wind shear diminishing, the typhoon developed an eye and became more symmetrical. The JTWC estimates that Krovahn peaked with an intensity equal to that of a Category 3 typhoon. The convective core started to struggle due to dry air over the western periphery and Krovanh moved in an area of increasing vertical windshear, resulting in a weakening trend. On September 19, both the JMA and the JTWC downgraded Krovanh to a severe tropical storm. On September 20, the center of Krovanh became fully exposed and the JMA later downgraded Krovanh to a tropical storm. Shortly thereafter, the JTWC issued their final warning. 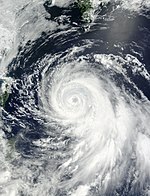 The JMA later issued its final warning on Krovanh on September 21, as it transitioned into an extratropical cyclone. The extratropical remnants of Krovanh lingered to the east of Japan for a few days with a cyclonic loop before turning to the northeast. The JTWC identified a tropical disturbance on September 17 about 220 km (135 mi) east-southeast of Ujelang Atoll. Late on September 21, gradual development occurred like persistent deep symmetric convection, and both the JMa and the JTWC upgraded the system to a tropical depression. On September 22, wind shear caused the circulation to become displaced to the east from the deep convection. Despite the wind shear, thunderstorm activity increased, prompting the JMA to upgraded the depression to a tropical storm. The JTWC did the same early on September 23. Dujuan entered the Philippine area of responsibility and was named Jenny. On the next day, Dujuan entered a favorable environment and the JMA upgraded Dujuan to a severe tropical storm. With tightly curved banding wrapping around the eye, both agencies assessed Dujuan's intensity at typhoon strength. Following an improved and intense convective core structure with cooler cloud tops surrounding a large 38-nm wide eye. Dujuan started to undergo explosive intensification. On September 27, Dujuan rapidly reached peak intensity based on JTWC data, with winds of 240 km/h (150 mph). The typhoon became more symmetric, taking on annular characteristics, while featuring a large and well-defined eye. With favorable environments aloft, evident by excellent radial outflow, deep convective banding and very low shear, Dujuan maintained its intensity. However, on September 28, Dujuan's large symmetrical eye began to be cloud-filled as it interacted with the mountainous country of Taiwan, resulting in weakening and then landfall over Nan'ao, Yilan. Dujuan continued to wekane and by the morning of September 29, the JTWC issued their final warning. While making its second landfall over Xiuyu District, Putian of Fujian, the JMA downgraded Dujuan to a severe tropical storm, then a tropical storm later as it rapidly deteriorated over land. It was last noted during September 30 inland over the Chinese province of Jiangxi. On September 28, a cluster of thunderstorms developed into a tropical disturbance near Palau. With more organization, the JMA classified the system as a tropical depression early on September 30. On the next day, the PAGASA upgraded it to a tropical depression, assigning it the name Kabayan. Later that day, the JTWC started following the storm. All three agencies then classified Kabayan as a tropical storm, with the JMA naming it Mujigae. By October 2, Mujigae made landfall over Aurora province. After briefly weakening over land, Mujigae reemerged into the South China Sea, where warm sea-surface temperatures favored development. The JMA re-upped the intensity to severe tropical storm strength. On the next day, an eye began to form, prompting the JMA and the JTWC to classify Mujigae as a typhoon. Due to favorable conditions aloft, Mujigae explosively intensified into a Category 4-equaivlent typhoon (based on JTWc data) as cooling clouds tops surrounded the eye. At the same time, Mujigae made landfall over Zhanjiang and, according to the JTWC, briefly reached peak intensity with winds of 215 km/h (130 mph); however, according to the JMA, the typhoon was not quite as intense. A few hours later, the JTWC issued its final warning as Mujigae rapidly weakened over land. Later in the same day, the JMA downgraded Mujigae to a severe tropical storm, then a tropical storm. The JMA issued its final advisory on Mujigae as it further weakened to a tropical depression early on October 5. On October 1, the JMA started to monitor a tropical depression near Wake Island. By the next day, the system's circulation became expansive as the JMA upgraded the depression to a tropical storm, naming it Choi-wan. The JTWC classified the system as a tropical storm by October 2, due to improved banding features, despite a large windfield. Despite favorable conditions, Choi-wan maintained its intensity as a weak system due to a large and very broad circulation; mesovortices were seen on satellite imagery rotating cyclonically in its center. On October 4, Choi-wan began to consolidate and develop a ragged eye. Based on this, the JMA upgraded Choi-wan to a severe tropical storm. On October 6, the JTWC upgraded the storm to a typhoon. Later that day, Choi-wan reached its peak intensity of 130 km/h (80 mph) while exhibiting an elongated microwave eye feature. On October 7, Choi-wan started to slowly weaken in response to southwesterly shear that caused its eye to become cloud-filled. Later that day, the JTWC issued its final warning as Choi-wan moved further northward with increasing and high vertical wind shear and was downgraded to high-end tropical storm intensity. According to the JMA, with Choi-wan becoming extratropical early on October 8, they issued their final warning and stated that Choi-wan reached peak strength with a minimum pressure of 955 hPa still as a severe tropical storm, without reaching typhoon intensity. On October 11, an area of convection persisted approximately 528 km (328 mi) north of Pohnpei. Hours later, the JMA upgraded the system to a tropical depression. The JTWC later followed suit on October 13. Despite some shear, the depression developed rain bands and a central dense overcast. Then, the JMA reported that the cyclone attained tropical storm intensity. Koppu, while moving westward, initially showed a partially exposed circulation due to continued shear. At around this time, PAGASA started issuing advisories on Koppu as it entered their area of responsibility and was named Lando. On October 15, the JMA reported that Koppu reached typhoon status as convection consolidated around an apparent microwave eye. With SSTs over 31 °C over the Philippine Sea, intensification continued and on October 17, Koppu developed an eye and was raised by the JTWC to an intensity equal to a Category 3 hurricane, Twelve hours later, both the JTWC and JMA estimated that Koppu reached peak intensity, with the JTWC upgrading it to a super typhoon. Initially, the JTWC forecasted Koppu to reach Category 5 intensity, however the typhoon made landfall earlier than expected in the eastern Philippines. During October 13, the JMA and the JTWC reported that a tropical depression developed northeast of Pohnpei State in the Marshall Islands. During the early hours of October 14, the JMA and JTWC upgraded the depression into Tropical Storm Champi, despite limited convection. Moving in a west-northwestward direction, Champi was steadily intensifying in a favorable environment aloft with cooling cloud tops. While passing through the Mariana Islands, Champi was deemed as a severe tropical storm by the JMA. 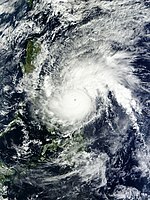 Early on October 16, Champi intensified to a typhoon. Following the formation of an eye, surrounded by a deep convective core, the typhoon began to steadily deepen as it moved in a northward direction. Therefore, Champi reached peak intensity; according to the JTWC the typhoon peaked at super typhoon intensity while the JMA estimated peak winds of 165 km/h (105 mph) on October 18. The next day, Champi started to weaken as the cyclone became increasingly asymmetric and dry air started to wrap into the storm's core. Convection briefly increased on October 20, but the re-intensification was short-lived as on October 22, Champi started to interact with strong mid-latitude westerly flow, creating increased wind shear. Convection rapidly decayed over Champi and the JMA downgraded it to a severe tropical storm. Both the JTWC and the JMA issued their final advisory as Champi became extratropical on October 25. The extratropical remnants crossed the basin on October 26, and fully dissipated on October 28 south of Alaska. On October 20, the JMA started to monitor a tropical depression embedded within a moderately conducive environment aloft, about 400 km (250 mi) to the southwest of Wake Island. The depression's low level circulation center was fully exposed, while isolated amounts of deep atmospheric convection flared over the systems southwestern quadrant. Following an increase in convection of the center, the JTWC subsequently initiated advisories on the system and classified it as Tropical Depression 26W during October 22, while it was located about 1,430 km (890 mi) to the east of Iwo To, Japan. During that day the system interacted with the mid-latitude westerly flow and transitioned into an extra tropical cyclone, as it rounded the edge of a ridge. During their post-analysis of the system, the JTWC determined that the system was a subtropical depression rather than a tropical depression. During November 16, the JMA started to monitor a tropical depression, about 200 km (125 mi) southeast of Kosrae in the Federal States of Micronesia. Moving north-westward within a favorable environment aloft, the JTWC classified the system as a tropical depression early on November 17. Twelve hours later, the JMA upgraded the depression to tropical storm intensity. After developing a brief eye, the JTWC upgraded In-fa to a typhoon, only to weaken back to a tropical storm hours later according to both agencies. However, on November 20, the JTWC upgraded In-fa back to a typhoon and the JMA to a severe tropical storm after following an increase in organization. After its eye became better organized and symmetric early on November 21, the JTWC classified In-fa as a Category 4-equivalent typhoon, while the JMA reported that In-fa peaked in intensity, with winds of 175 km/h (110 mph). Shortly after its peak, the eye of In-fa became less defined. On November 22, Typhoon Infa entered PAGASA's warning zone, receiving the local name Marilyn. In-fa became less organized due to increased shear, In-fa started to turn northwards late on November 23. The next day, In-fa further weakened to severe tropical storm strength, and to tropical storm strength on November 25. During November 26, In-fa started to transition into an extratropical cyclone, before the system dissipated during the next day as it merged with a front. During December 10, the JMA started to monitor a tropical depression, that had developed about 665 km (415 mi) to the south of Guam. By December 11, the JMA upgraded it to a tropical storm, naming it Melor, while the JTWC and PAGASA started tracking the system, which was tracking west-northwestward along the southern periphery of a ridge, the latter naming it Nona. Situated in favorable environment with low shear and warm SSTs, Melor intensfied steadily. 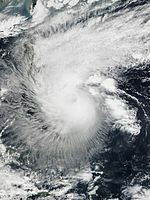 On December 13, Melor attained typhoon intensity. Following an episode of rapid intensification, the JMA estimates that Melor peaked with winds of 175 km/h (115 mph). However, later Melor made its first landfall over in Eastern Samar, which briefly caused weakening. After meandering for several days, Melor emerged to the South China Sea on December 16, but continued weakening due to unfavorable conditions. Data from the JMA suggests that Melor dissipated early on December 17. According to NDRRMC, a total of 42 people were killed and ₱6.46 billion (US$136 million) were total of infrastructure and agricultural damages caused by Melor (Nona). Oriental Mindoro was placed under a state of calamity due to the devastation caused by the typhoon. Pinamalayan in Oriental Mindoro was worst hit, with 15,000 homes destroyed, leaving 24,000 families in evacuation centers. Due to the severe damage brought about by the typhoon in the provinces of Southern Luzon, Oriental Mindoro, and Visayas, Philippine President Benigno Aquino III declared a "State of National Calamity" in the country. During December 13, a tropical disturbance developed within a favourable environment for further development, about 1,165 km (725 mi) to the southeast of Yap Island. Over the next day the system gradually moved north-westwards and was classified as a tropical depression by the JMA. With enough convection, the JTWC started to track the system with the designation of 29W. Moving westwards, 29W entered the Philippine area of responsibility, with PAGASA naming it as Onyok. Onyok reached its peak intensity on December 17, when flaring convection near its center had weakened and became exposed. The system rapidly deteriorated when the JTWC issued its final advisory early the next day. The system was last noted by the JMA during the next day, as it made landfall over Davao Oriental in Mindanao. Infrastructural damage were at Php 1.1 million (US$23,300). On January 1, Tropical Depression Jangmi (Seniang) from the previous season was active within the Sulu Sea to the north of Malaysia. Over the next day the system moved southwards, before it made landfall on Malaysia and dissipated. During January 2, a tropical depression developed to the northwest of Brunei, within an area that was marginally favorable for further development. Over the next day the system moved into an area of moderate vertical wind shear, with atmospheric convection becoming displaced to the west of the fully exposed low level circulation center. The system was subsequently last noted by the JMA during January 4, as it dissipated in the South China Sea near the Malaysian-Indonesian border. During July 1, a tropical depression developed, about 700 km (435 mi) to the southeast of Hagåtña, Guam. Over the next day the system remained near stationary, before it dissipated during July 2. On July 14, the JMA started to monitor a weak tropical depression several kilometers east-northeast of the Philippines. The system showed intensification; however, the JMA issued its final warning on the system shortly thereafter. On July 15, the JMA re-initiated advisories on the depression. The depression moved in a northward direction as it was absorbed by the outflow of Typhoon Nangka the next day. 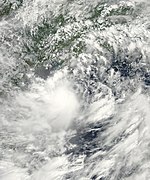 Another tropical depression developed on July 18 and dissipated near Japan and south of the Korean Peninsula on July 20. During July 20, the JMA briefly monitored a tropical depression that had developed over the Chinese province of Guangdong. 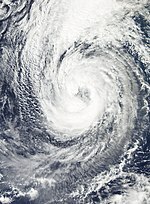 During August 26, the remnants of Hurricane Loke moved into the basin from the Central Pacific and were immediately classified as an extra-tropical cyclone. During October 6, the remnants of Tropical Depression 08C moved into the basin from the Central Pacific and were classified as a tropical depression by the JMA. The system drifted slowly in a westward direction until it started deteriorating, and the JMA downgraded the depression to a low-pressure area late on October 7. Its remnants continued moving westward which became Tropical Storm Koppu. During October 19, the JMA started to monitor a tropical depression that had developed, about 375 km (235 mi) to the south-west of Wake Island. The system was located within a marginal environment for further development, with moderate vertical wind shear and weak convergence preventing atmospheric convection from developing over the depression. Over the next couple of days the system moved and near the subsidence side of Typhoon Champi, before it was last noted by the JMA on October 22. The final tropical depression of the system developed on December 20 north of Malaysia. The system moved in a slow westward direction for a few days until it was last monitored on December 23, ending the season. 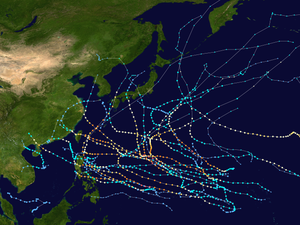 Within the Northwest Pacific Ocean, both the Japan Meteorological Agency (JMA) and the Philippine Atmospheric, Geophysical and Astronomical Services Administration (PAGASA) assign names to tropical cyclones that develop in the Western Pacific, which can result in a tropical cyclone having two names. The Japan Meteorological Agency's RSMC Tokyo — Typhoon Center assigns international names to tropical cyclones on behalf of the World Meteorological Organization's Typhoon Committee, should they be judged to have 10-minute sustained windspeeds of 65 km/h (40 mph). PAGASA names to tropical cyclones which move into or form as a tropical depression in their area of responsibility located between 135°E and 115°E and between 5°N and 25°N even if the cyclone has had an international name assigned to it. The names of significant tropical cyclones are retired, by both PAGASA and the Typhoon Committee. Should the list of names for the Philippine region be exhausted then names will be taken from an auxiliary list of which the first ten are published each season. Unused names are marked in gray. During the season 25 tropical storms developed in the Western Pacific and each one was named by the JMA, when the system was judged to have 10-minute sustained windspeeds of 65 km/h (40 mph). The JMA selected the names from a list of 140 names, that had been developed by the 14 members nations and territories of the ESCAP/WMO Typhoon Committee. During the season the names Atsani, Champi and In-fa were used for the first time, after they had replaced the names Morakot, Ketsana and Parma, which were retired after the 2009 season. After the season the Typhoon Committee retired the names Soudelor, Mujigae, Koppu and Melor from the naming lists, and in February 2017, the names were subsequently replaced with Saudel, Surigae, Koguma and Cempaka for future seasons, respectively. During the season PAGASA used its own naming scheme for the 15 tropical cyclones, that either developed within or moved into their self-defined area of responsibility. The names were taken from a list of names, that had been last used during 2011 and are scheduled to be used again during 2019. The names Betty, Jenny, Marilyn, and Nona were used for the first (and only, in case of Nona) time during the year after the names Bebeng, Juaning and Mina were retired. The name Nonoy was originally included on the list; however, for political reasons as it sounds like Noynoy, the former President of the country, it was redacted and replaced with Nona in mid-December when Tropical Storm Melor entered PAGASA's AoR. After the season the names Lando and Nona were retired by PAGASA, as they had caused over ₱1 billion in damages. They were subsequently replaced on the list with the names Liwayway and Nimfa. This table summarizes all the systems that developed within or moved into the North Pacific Ocean, to the west of the International Date Line during 2015. The tables also provide an overview of a systems intensity, duration, land areas affected and any deaths or damages associated with the system. ^ "INFLUENCES OF NATURAL VARIABILITY AND ANTHROPOGENIC FORCING ON THE EXTREME 2015 ACCUMULATED CYCLONE ENERGY IN THE WESTERN NORTH PACIFIC" (PDF). Zhang, W. Et Al. December 2016. ^ a b c d Saunders, Mark; Lea, Adam (May 6, 2015). Extended Range Forecast for Northwest Pacific Typhoon Activity in 2015 (PDF) (Report). Tropical Storm Risk Consortium. Retrieved May 6, 2015. ^ a b c Saunders, Mark; Lea, Adam (August 5, 2015). August Forecast Update for Northwest Pacific Typhoon Activity in 2015 (PDF) (Report). Tropical Storm Risk Consortium. Archived (PDF) from the original on August 8, 2015. Retrieved August 5, 2015. ^ a b c d Malano, Vicente B (January 8, 2015). January — June 2015 (Seasonal Climate Outlook). Philippine Atmospheric, Geophysical and Astronomical Services Administration. Archived from the original on June 3, 2015. Retrieved June 1, 2015. ^ a b More Typhoons due to ENSO, While Two to Four Expected to Hit Taiwan in 2015 (doc) (Report). Taiwan Central Weather Bureau. June 30, 2015. Retrieved July 19, 2015. ^ a b c Malano, Vicente B (July 6, 2015). July — December 2015 (PDF) (Seasonal Climate Outlook). Philippine Atmospheric, Geophysical and Astronomical Services Administration. Archived (PDF) from the original on July 24, 2015. Retrieved July 24, 2015. ^ a b c Pacific El Nino-Southern Oscillation (ENSO) Applications Climate Center (May 29, 2015). "Pacific ENSO Update: 2nd Quarter 2015" (PDF). 21 (2). United States National Oceanic and Atmospheric Administration's National Weather Service. Archived (PDF) from the original on July 24, 2015. ^ a b "The 2015 Rainy Season Climate Expectation of Thailand". Thai Meteorological Department. June 26, 2015. Archived from the original on July 24, 2015. Retrieved July 24, 2015. ^ a b Pacific El Nino-Southern Oscillation (ENSO) Applications Climate Center (August 14, 2015). "Pacific ENSO Update: 3rd Quarter 2015" (PDF). 21 (3). United States National Oceanic and Atmospheric Administration's National Weather Service. Archived (PDF) from the original on August 15, 2015. Retrieved August 15, 2015. ^ a b c d Guy Carpenter Asia-Pacific Climate Impact Center; School of Energy and Environment (July 16, 2015). 2015 Western North Pacific Basin Tropical Cyclone Predictions (PDF) (Report). City University of Hong Kong. Archived (PDF) from the original on July 24, 2015. Retrieved July 24, 2015. ^ a b c d Tropical Storm Jangmi (RSMC Tropical Cyclone Best Track). Japan Meteorological Agency. January 19, 2014. Archived from the original on January 19, 2015. Retrieved January 19, 2014. ^ a b Padgett, Gary; Boyle, Kevin; Chunliang, Huang (January 2015). "Monthly Global Tropical Cyclone Summary January 2015". Summaries and Track Data. Australiansevereweather.com. Retrieved February 18, 2015. ^ Padgett, Gary; Boyle, Kevin; Chunliang, Huang (February 2015). "Monthly Global Tropical Cyclone Summary February 2015". Summaries and Track Data. Australiansevereweather.com. Retrieved March 10, 2015. ^ a b "Pacific ENSO Update: 2nd Quarter 2015" (PDF). 21 (2). United States Pacific El Niño-Southern Oscillation (ENSO) Applications Climate Center. May 29, 2015. Archived (PDF) from the original on March 19, 2016. ^ Young, Steve. "Global Tropical System Tracks — March 2015". Australian Severe Weather. Archived from the original on August 16, 2015. Retrieved August 8, 2015. ^ Padgett, Gary; Boyle, Kevin; Chunliang, Huang (April 2015). "Monthly Global Tropical Cyclone Summary April 2015". Summaries and Track Data. Australiansevereweather.com. Retrieved July 27, 2015. ^ Padgett, Gary; Boyle, Kevin; Chunliang, Huang (May 2015). "Monthly Global Tropical Cyclone Summary May 2015". Summaries and Track Data. Australiansevereweather.com. Retrieved July 27, 2015. ^ a b c Young, Steve (July 27, 2015). "Monthly Global Tropical Cyclone Tracks: June 2015". Australia Severe Weather. Retrieved August 1, 2015. ^ Padgett, Gary; Boyle, Kevin; Chunliang, Huang (July 2015). "Monthly Global Tropical Cyclone Summary July 2015". Summaries and Track Data. Australiansevereweather.com. Retrieved August 31, 2015. ^ Padgett, Gary; Boyle, Kevin; Chunliang, Huang (August 2015). "Monthly Global Tropical Cyclone Summary August 2015". Summaries and Track Data. Australiansevereweather.com. Retrieved October 8, 2015. ^ Padgett, Gary; Boyle, Kevin; Chunliang, Huang (September 2015). "Monthly Global Tropical Cyclone Summary September 2015". Summaries and Track Data. Australiansevereweather.com. Retrieved December 29, 2015. ^ Padgett, Gary; Boyle, Kevin; Chunliang, Huang (October 2015). "Monthly Global Tropical Cyclone Summary October 2015". Summaries and Track Data. Australiansevereweather.com. Retrieved December 29, 2015. ^ Padgett, Gary; Boyle, Kevin; Chunliang, Huang (November 2015). "Monthly Global Tropical Cyclone Summary November 2015". Summaries and Track Data. Australiansevereweather.com. Retrieved December 29, 2015. ^ Padgett, Gary; Boyle, Kevin; Chunliang, Huang (December 2015). "Monthly Global Tropical Cyclone Summary December 2015". Summaries and Track Data. Australiansevereweather.com. Retrieved February 9, 2016. ^ a b Tropical Storm Mekkhala (RSMC Tropical Cyclone Best Track). Japan Meteorological Agency. February 17, 2015. Archived from the original on February 17, 2015. Retrieved July 9, 2016. ^ "JTWC 2015 best track analysis: Tropical Storm 01W: Mekkhala" (DAT). United States Joint Typhoon Warning Center. Retrieved July 9, 2016. ^ "Prognostic Reasoning for Tropical Depression 01W (One) Warning Nr 03". Joint Typhoon Warning Center. January 14, 2015. Archived from the original on January 14, 2015. ^ "TS 1501 MEKKHALA (1501) UPGRADED FROM TD". Japan Meteorological Agency. January 14, 2015. Archived from the original on January 14, 2015. ^ "'Amang' may intensify into storm but landfall now unlikely". Inquirer.net. January 14, 2015. ^ "Tropical Storm 01W (Mekkhala) Warning Nr 007". Joint Typhoon Warning Center. January 15, 2015. Archived from the original on January 15, 2015. ^ "Prognostic Reasoning for Tropical Storm 01W (Mekkhala) Warning Nr 07". Joint Typhoon Warning Center. January 15, 2015. Archived from the original on January 15, 2015. ^ "Prognostic Reasoning for Tropical Storm 01W (Mekkhala) Warning Nr 11". Joint Typhoon Warning Center. January 16, 2015. Archived from the original on January 16, 2015. ^ "STS 1501 MEKKHALA (1501) UPGRADED FROM TS". Japan Meteorological Agency. January 16, 2015. Archived from the original on January 17, 2015. ^ "Prognostic Reasoning for Typhoon 01W (Mekkhala) Warning Nr 14". Joint Typhoon Warning Center. January 16, 2015. Archived from the original on January 17, 2015. ^ "TY 1501 MEKKHALA (1501) UPGRADED FROM STS". Japan Meteorological Agency. January 17, 2015. Archived from the original on January 17, 2015. ^ "RSMC TROPICAL CYCLONE BEST TRACK 1501 MEKKHALA (1501)". Japan Meteorological Agency. February 17, 2015. ^ "SitRep. No. 06 re Effects of Tropical Storm "AMANG" (MEKKHALA)" (PDF). National Disaster Risk Reduction and Management Council. Archived (PDF) from the original on January 19, 2015. Retrieved January 19, 2015. ^ "Prognostic Reasoning for Tropical Storm 01W (Mekkhala) Warning Nr 17". Joint Typhoon Warning Center. January 17, 2015. Archived from the original on January 18, 2015. ^ "Prognostic Reasoning for Tropical Storm 01W (Mekkhala) Warning Nr 19". Joint Typhoon Warning Center. January 18, 2015. Archived from the original on January 18, 2015. ^ "Tropical Depression 01W (Mekkhala) Warning Nr 022A". Joint Typhoon Warning Center. January 18, 2015. Archived from the original on January 19, 2015. ^ "TD DOWNGRADED FROM TS 1501 MEKKHALA (1501)". Japan Meteorological Agency. January 18, 2015. Archived from the original on January 18, 2015. ^ a b Mar S. Arguelles (January 21, 2015). "Storm 'Amang' leaves 3 people dead, P318.7M in damages in Bicol". Philippine News Agency. Interaksyon. Archived from the original on April 2, 2015. Retrieved March 24, 2015. ^ "SitRep No. 10 re Effects of Tropical Storm "Amang" (MEKKHALA)" (PDF). National Disaster Risk Reduction and Management Council. January 20, 2015. Archived (PDF) from the original on February 6, 2015. Retrieved January 23, 2015. ^ Levine, Brittany (January 16, 2015). "New typhoon soaks Pope Francis' trip to storm-ravaged Philippine city". Mashable. Retrieved January 20, 2015. ^ a b c d e f Typhoon Higos (RSMC Tropical Cyclone Best Track). Japan Meteorological Agency. March 4, 2015. Archived from the original on March 4, 2015. Retrieved August 24, 2016. ^ "Tropical Depression 02W (Two) Warning Nr 001". Joint Typhoon Warning Center. February 6, 2015. Archived from the original on February 7, 2015. ^ "Prognostic Reasoning for Tropical Storm 02W (Higos) Warning Nr 03". Joint Typhoon Warning Center. February 7, 2015. Archived from the original on February 7, 2015. ^ "Prognostic Reasoning for Tropical Storm 02W (Higos) Warning Nr 04". Joint Typhoon Warning Center. February 8, 2015. Archived from the original on February 8, 2015. ^ "Prognostic Reasoning for Typhoon 02W (Higos) Warning Nr 07". Joint Typhoon Warning Center. February 8, 2015. Archived from the original on February 9, 2015. ^ "TY 1502 HIGOS (1502) UPGRADED FROM STS". Japan Meteorological Agency. February 9, 2015. Archived from the original on February 10, 2015. ^ "Prognostic Reasoning for Typhoon 02W (Higos) Warning Nr 14". Joint Typhoon Warning Center. February 10, 2015. Archived from the original on February 11, 2015. ^ "Prognostic Reasoning for Tropical Storm 02W (Higos) Warning Nr 17". Joint Typhoon Warning Center. February 11, 2015. Archived from the original on February 11, 2015. ^ "Tropical Depression 02W (Higos) Warning Nr 018". Joint Typhoon Warning Center. February 11, 2015. Archived from the original on February 7, 2015. ^ "Significant Tropical Weather Advisory for the Western and South Pacific Oceans March 8, 2015 23z". Joint Typhoon Warning Center. Archived from the original on March 10, 2015. Retrieved August 16, 2015. ^ a b c d e f Tropical Storm Bavi (RSMC Tropical Cyclone Best Track). Japan Meteorological Agency. April 21, 2015. Archived from the original on April 21, 2015. Retrieved August 8, 2015. ^ "Prognostic Reasoning for Tropical Depression 03W (Three) Warning Nr 01". Joint Typhoon Warning Center. March 12, 2015. Archived from the original on March 12, 2015. Retrieved August 8, 2015. ^ a b "JTWC 2015 best track analysis: Tropical Storm Bavi 03W" (DAT). United States Joint Typhoon Warning Center. Retrieved July 9, 2016. ^ a b c d e "Storm Events Database: Guam: Tropical Storm Bavi". United States National Centers for Environmental Information. Retrieved July 9, 2016. ^ "Severe Weather Bulletin Number One, Tropical Cyclone Alert: Tropical Storm "Betty" (Bavi)". Philippine Atmospheric, Geophysical and Astronomical Services Administration. March 17, 2015. Archived from the original on March 18, 2015. Retrieved July 9, 2016. ^ a b c d "Storm Events Database: Marshall Islands: Tropical Storm Bavi". United States National Centers for Environmental Information. Archived from the original on March 18, 2016. Retrieved March 18, 2016. ^ Ferdie De La Torre (March 16, 2015). "166 seek shelter as Bavi batters NMI". Retrieved April 4, 2015. ^ "MEDIUM from ABPW10 2015-03-25". Joint Typhoon Warning Center. Archived from the original on March 26, 2015. Retrieved March 27, 2015. ^ "Tropical Depression (< 30kts) from JMA 2015-03-26". Japan Meteorological Agency. Archived from the original on March 26, 2015. Retrieved March 27, 2015. ^ "JTWC Warning 001 for TD 04W". JTWC. Archived from the original on March 27, 2015. Retrieved March 27, 2015. ^ "Prognostic Reasoning for Warning 003 on Tropical Storm 04W". Joint Typhoon Warning Center. Archived from the original on March 27, 2015. Retrieved March 27, 2015. ^ "Tropical Storm Maysak from JMA 2015-03-27". JMA. Archived from the original on March 27, 2015. Retrieved March 28, 2015. ^ "Prognostic Reasoning for Warning 007 of Tropical Storm Maysak". Joint Typhoon Warning Center. Archived from the original on March 28, 2015. Retrieved March 28, 2015. ^ "STS Maysak from JMA 281200". Japan Meteorological Agency. Archived from the original on March 28, 2015. Retrieved March 28, 2015. ^ "Prognostic Reasoning for Warning 008 on Typhoon Maysak". Joint Typhoon Warning Center. Archived from the original on March 29, 2015. Retrieved March 29, 2015. ^ "Typhoon Maysak from JMA 281800". Japan Meteorological Agency. Archived from the original on March 29, 2015. Retrieved March 29, 2015. ^ "Prognostic Reasoning for Warning 16 on Typhoon Maysak". JTWC. Archived from the original on March 31, 2015. Retrieved March 31, 2015. ^ "NDRRMC Update re Severe Weather Bulletin No. 01 Typhoon Chedeng" (PDF). NDRRMC. Retrieved April 1, 2015. ^ Robert Q. Tupaz (March 31, 2015). "Chuuk hit hard by Typhoon Maysak". Marianas Variety. Retrieved March 31, 2015. ^ a b Tropical Storm Haishen (RSMC Tropical Cyclone Best Track). Japan Meteorological Agency. May 19, 2015. Archived from the original on May 19, 2015. Retrieved August 8, 2015. ^ "Tropical Depression 05W (Five) Warning Nr 001". Joint Typhoon Warning Center. April 3, 2015. Archived from the original on April 3, 2015. ^ "Prognostic Reasoning for Tropical Storm 05W (Five) Warning Nr 05". Joint Typhoon Warning Center. April 4, 2015. Archived from the original on April 4, 2015. ^ "TS 1505 HAISHEN (1505) UPGRADED FROM TD". Japan Meteorological Agency. April 4, 2015. Archived from the original on April 5, 2015. ^ "Prognostic Reasoning for Tropical Storm 05W (Haishen) Warning Nr 10". Joint Typhoon Warning Center. April 5, 2015. Archived from the original on April 6, 2015. ^ a b c d e f g "Storm Events Database: Guam: Tropical Storm Haishen". United States National Centers for Environmental Information. Retrieved July 9, 2016. ^ "Significant Tropical Weather Advisory for the Western and South Pacific Oceans Reissued 301400Z Apr 2015-010600Z May 2015". Joint Typhoon Warning Center. Archived from the original on May 2, 2015. Retrieved May 10, 2015. ^ "Tropical Cyclone Advisory for Analysis and Forecast 2015-05-02T21:00:00Z". Japan Meteorological Agency. Retrieved May 2, 2015. ^ "Forecast Track by Numerical Weather Prediction 2015-05-03T18:00:00Z". Japan Meteorological Agency. Retrieved May 3, 2015. ^ "Forecast Track by Numerical Weather Prediction 2015-05-05T18:00:00Z". Japan Meteorological Agency. Retrieved May 5, 2015. ^ "Severe Weather Bulletin No.01 re TY DODONG (NOUL)" (PDF). NDRRMC. May 7, 2015. Retrieved May 7, 2015. ^ "Powerful Typhoon Noul targets northern Philippines this weekend". Jason Samenow. May 7, 2015. ^ Masters, Jeff (May 8, 2015). "Subtropical Storm Ana More Organized; Philippines' Cat 3 Noul Intensifying". Weather Underground. Retrieved May 9, 2015. ^ "RSMC Tropical Cyclone Advisory 100000". Japan Meteorological Agency. Archived from the original on May 10, 2015. Retrieved May 10, 2015. ^ "Prognostic Reasoning for Super Typhoon 06W (Noul) Warning Nr 29". Joint Typhoon Warning Center. Archived from the original on May 10, 2015. Retrieved May 10, 2015. ^ "Severe Weather Bulletin #15 for: Typhoon "Dodong"" (PDF). Philippine Atmospheric, Geophysical and Astronomical Services Administration. Archived (PDF) from the original on May 10, 2015. Retrieved May 10, 2015. ^ "Prognostic Reasoning for Super Typhoon 06W (Noul) Warning Nr 28". Joint Typhoon Warning Center. Archived from the original on May 10, 2015. Retrieved May 10, 2015. ^ "Warning and Summary". Japan Meteorological Agency. May 6, 2015. Archived from the original on May 9, 2015. ^ "Tropical Depression 07W (Seven) Warning NR 001". Joint Typhoon Warning Center. May 6, 2015. Archived from the original on May 9, 2015. ^ "RSMC Tropical Cyclone Advisory". Japan Meteorological Agency. May 6, 2015. Archived from the original on May 10, 2015. ^ "RSMC Tropical Cyclone Advisory". Japan Meteorological Agency. May 12, 2015. Archived from the original on May 12, 2015. ^ "Typhoon 07W (Seven) Warning NR 026". Joint Typhoon Warning Center. May 12, 2015. Archived from the original on May 13, 2015. ^ "RSMC Tropical Cyclone Advisory". Japan Meteorological Agency. May 13, 2015. Archived from the original on May 14, 2015. ^ "Tracking Data for Super Typhoon Dolphin". Unisys Weather. Retrieved August 5, 2015. ^ "Detailed Track Information for Typhoon Dolphin (201507)". Digital Typhoon. June 22, 2015. Retrieved August 5, 2015. 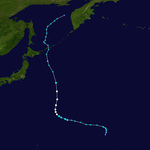 ^ a b c Tropical Storm Kujira (RSMC Tropical Cyclone Best Track). Japan Meteorological Agency. July 17, 2015. Archived from the original on July 17, 2015. Retrieved August 15, 2015. ^ "Prognostic Reasoning for Tropical Depression 08W (Eight) Warning Nr 01". Joint Typhoon Warning Center. March 12, 2015. Archived from the original on June 28, 2015. Retrieved August 8, 2015. ^ "Prognostic Reasoning for Tropical Depression 08W (Eight) Warning Nr 02". Joint Typhoon Warning Center. Archived from the original on June 28, 2015. Retrieved June 20, 2015. ^ "Guidance – Forecast Track by Numerical Weather Prediction 2015-06-21T00:00:00Z". Japan Meteorological Agency. Retrieved June 21, 2015. ^ "TS 1508 KUJIRA (1508) UPGRADED FROM TD". Japan Meteorological Agency. Archived from the original on June 28, 2015. Retrieved June 21, 2015. ^ "Tropical Cyclone Advisory for Analysis and Forecast 2015-06-22T09:00:00Z". Japan Meteorological Agency. Retrieved June 22, 2015. ^ "Prognostic Reasoning for Tropical Storm 08W (Kujira) Warning Nr 07". Joint Typhoon Warning Center. Archived from the original on June 28, 2015. Retrieved June 22, 2015. ^ "Prognostic Reasoning for Tropical Storm 08W (Kujira) Warning Nr 08". Joint Typhoon Warning Center. Archived from the original on June 28, 2015. Retrieved June 22, 2015. ^ "TS 1508 KUJIRA (1508)". Japan Meteorological Agency. Archived from the original on June 28, 2015. Retrieved June 22, 2015. ^ "Prognostic Reasoning for Tropical Storm 08W (Kujira) Warning Nr 09". Joint Typhoon Warning Center. Archived from the original on June 28, 2015. Retrieved June 22, 2015. ^ "Prognostic Reasoning for Tropical Depression 08W (Kujira) Warning Nr 11". Joint Typhoon Warning Center. Archived from the original on June 28, 2015. Retrieved June 23, 2015. ^ Joel Locsin (June 23, 2015). "PAGASA: Start of rainy season to raise dam water levels, help irrigation". GMA News. Retrieved July 2, 2015. ^ China Member Report (PDF) (Report). ESCAP/WMO Typhoon Committee 10th Integrated Workshop. 2015. Retrieved January 10, 2016. ^ a b Phan Hau-Ngoc Khanh (June 26, 2015). "9 dead, 6 missing in flash floods unleashed by Typhoon Kujira". Thanh Nien News. Retrieved June 30, 2015. ^ "Flash floods kill 9, leave 6 others missing in northern Vietnam". Tuoi Tre News. June 28, 2015. Retrieved June 30, 2015. ^ a b Ra đường tung lưới bắt cá sau bão số 1 ở Sơn La Archived June 27, 2015, at the Wayback Machine VietNamNet (in Vietnamese). Retrieved August 29, 2015. ^ Significant Tropical Weather Outlook for the Western and South Pacific Oceans (Report). Joint Typhoon Warning Center. June 25, 2015. Archived from the original on June 28, 2015. Retrieved July 12, 2015. ^ "RSMC Tropical Cyclone Advisory". Japan Meteorological Agency. June 30, 2015. Archived from the original on July 2, 2015. Retrieved July 12, 2015. ^ Prognostic Reasoning for Tropical Depression 09W (Chan-hom) Warning Nr 01 (Report). Joint Typhoon Warning Center. June 30, 2015. Archived from the original on July 2, 2015. Retrieved July 12, 2015. ^ Prognostic Reasoning for Typhoon 09W (Chan-hom) Warning Nr 09 (Report). Joint Typhoon Warning Center. July 2, 2015. Archived from the original on July 2, 2015. Retrieved July 12, 2015. ^ "RSMC Tropical Cyclone Advisory". Japan Meteorological Agency. July 2, 2015. Archived from the original on July 3, 2015. Retrieved July 12, 2015. ^ Prognostic Reasoning for Tropical Storm 09W (Chan-hom) Warning Nr 11 (Report). Joint Typhoon Warning Center. July 3, 2015. Archived from the original on July 3, 2015. Retrieved July 12, 2015. ^ Prognostic Reasoning for Typhoon 09W (Chan-hom) Warning Nr 10 (Report). Joint Typhoon Warning Center. July 2, 2015. Archived from the original on July 3, 2015. Retrieved July 12, 2015. ^ Prognostic Reasoning for Tropical Storm 09W (Chan-hom) Warning Nr 21 (Report). Joint Typhoon Warning Center. July 5, 2015. Archived from the original on July 5, 2015. Retrieved July 12, 2015. ^ Prognostic Reasoning for Typhoon 09W (Chan-hom) Warning Nr 25 (Report). Joint Typhoon Warning Center. July 6, 2015. Archived from the original on July 7, 2015. Retrieved July 12, 2015. ^ "RSMC Tropical Cyclone Advisory". Japan Meteorological Agency. July 6, 2015. Archived from the original on July 7, 2015. Retrieved July 12, 2015. ^ Prognostic Reasoning for Typhoon 09W (Chan-hom) Warning Nr 27 (Report). Joint Typhoon Warning Center. July 7, 2015. Archived from the original on July 7, 2015. Retrieved July 12, 2015. ^ Severe Weather Bulletin No. 01 re Typhoon "Falcon" (PDF) (Report). National Disaster Risk Reduction and Management Council. July 7, 2015. Retrieved July 12, 2015. ^ Prognostic Reasoning for Typhoon 09W (Chan-hom) Warning Nr 30 (Report). Joint Typhoon Warning Center. July 7, 2015. Archived from the original on July 7, 2015. Retrieved July 12, 2015. ^ Prognostic Reasoning for Typhoon 09W (Chan-hom) Warning Nr 33 (Report). Joint Typhoon Warning Center. July 8, 2015. Archived from the original on July 8, 2015. Retrieved July 12, 2015. ^ Prognostic Reasoning for Typhoon 09W (Chan-hom) Warning Nr 33 (Report). Joint Typhoon Warning Center. July 9, 2015. Archived from the original on July 9, 2015. Retrieved July 12, 2015. ^ Prognostic Reasoning for Typhoon 09W (Chan-hom) Warning Nr 39 (Report). Joint Typhoon Warning Center. July 10, 2015. Archived from the original on July 10, 2015. Retrieved July 12, 2015. ^ "RSMC Tropical Cyclone Advisory". Japan Meteorological Agency. July 9, 2015. Archived from the original on July 9, 2015. Retrieved July 12, 2015. ^ Prognostic Reasoning for Typhoon 09W (Chan-hom) Warning Nr 40 (Report). Joint Typhoon Warning Center. July 10, 2015. Archived from the original on July 10, 2015. Retrieved July 16, 2015. ^ Prognostic Reasoning for Typhoon 09W (Chan-hom) Warning Nr 41 (Report). Joint Typhoon Warning Center. July 10, 2015. Archived from the original on July 10, 2015. Retrieved July 16, 2015. ^ Jeff Masters (July 11, 2015). "Category 2 Typhoon Chan-hom Makes Landfall 80 Miles From Shanghai, China". Weather Underground. Retrieved July 16, 2015. ^ Prognostic Reasoning for Typhoon 09W (Chan-hom) Warning Nr 46 (Report). Joint Typhoon Warning Center. July 11, 2015. Archived from the original on July 12, 2015. Retrieved July 16, 2015. ^ "RSMC Tropical Cyclone Advisory". Japan Meteorological Agency. July 11, 2015. Archived from the original on July 11, 2015. Retrieved July 16, 2015. ^ RSMC Tropical Cyclone Best Track: Typhoon Chan-hom (Report). Japan Meteorological Agency. August 24, 2015. Archived from the original on August 24, 2015. Retrieved October 10, 2015. ^ "Typhoon Chan-hom: Extensive damage reported as system loses strength; departs eastern China for Korean peninsula". Australian Broadcasting Corporation. July 11, 2015. Retrieved July 11, 2015. ^ "Super typhoon Chan-hom batters Chinese coast". CCTV America. Associated Press. July 13, 2015. Retrieved July 13, 2015. ^ SitRep No. 10 re Effects of enhanced Southwest Monsoon (PDF) (Report). National Disaster Risk Reduction and Management Council. July 15, 2015. Retrieved July 16, 2015. ^ "Tropical Depression 10W (Ten) Warning Nr 001". Joint Typhoon Warning Center. July 2, 2015. Archived from the original on July 3, 2015. ^ "SEVERE WEATHER BULLETIN #1 TROPICAL DEPRESSION "EGAY"". PAGASA. July 2, 2015. Archived from the original on July 3, 2015. ^ "TS 1510 LINFA (1510) UPGRADED FROM TD". Japan Meteorological Agency. July 2, 2015. Archived from the original on July 3, 2015. ^ "Tropical Storm 10W (Linfa) Warning Nr 004". Joint Typhoon Warning Center. July 2, 2015. Archived from the original on July 3, 2015. ^ "STS 1510 LINFA (1510) UPGRADED FROM TS". Japan Meteorological Agency. July 3, 2015. Archived from the original on July 3, 2015. ^ "Prognostic Reasoning for Tropical Storm 10W (Linfa) Warning Nr 05". Joint Typhoon Warning Center. July 3, 2015. Archived from the original on July 3, 2015. ^ "Tropical Storm Linfa (Egay) makes landfall over Palanan, Isabela in the Philippines; expected to leave landmass by Sunday". Breakingnews.com. July 4, 2015. Retrieved March 28, 2016. ^ "Egay makes landfall over Palanan, Isabela; Signal 2 up over 6 areas". GMA News. July 4, 2015. ^ "Prognostic Reasoning for Tropical Storm 10W (Linfa) Warning Nr 17". Joint Typhoon Warning Center. July 6, 2015. Archived from the original on July 6, 2015. ^ "Prognostic Reasoning for Tropical Storm 10W (Linfa) Warning Nr 21". Joint Typhoon Warning Center. July 7, 2015. Archived from the original on July 7, 2015. ^ "Severe Weather Bulletin No. 20 (FINAL) & Gale Warning No. 10A re TS EGAY" (PDF). National Disaster Risk Reduction and Management Council. July 7, 2015. Retrieved February 9, 2016. ^ "Prognostic Reasoning for Tropical Storm 10W (Linfa) Warning Nr 26". Joint Typhoon Warning Center. July 8, 2015. Archived from the original on July 8, 2015. ^ "Prognostic Reasoning for Typhoon 10W (Linfa) Warning Nr 28". Joint Typhoon Warning Center. July 8, 2015. Archived from the original on July 8, 2015. ^ a b Typhoon Linfa (1510) (Report). Hong Kong Observatory. August 6, 2015. Retrieved February 14, 2016. ^ Prognostic Reasoning for Typhoon 10W (Linfa) Warning Nr 30. Joint Typhoon Warning Center (Report). United States Navy. July 9, 2015. Archived from the original on July 9, 2015. Retrieved February 9, 2015. ^ "Tropical Storm 10W (Linfa) Warning Nr 032". Joint Typhoon Warning Center. July 9, 2015. Archived from the original on July 10, 2015. ^ "TD DOWNGRADED FROM TS 1510 LINFA (1510)". Japa Meteorological Agency. July 10, 2015. Archived from the original on July 10, 2015. ^ NDRRMC Update – Final Report re Severe Tropical Storm Egay (PDF) (Report). National Disaster Risk Reduction and Management. July 7, 2015. Retrieved February 18, 2016. ^ Cite error: The named reference china report was invoked but never defined (see the help page). ^ "Typhoon Linfa affects over one million in China". Beijing, China: Zee News. July 10, 2015. Retrieved July 10, 2015. ^ a b 台风"莲花"登陆 陆丰48万人受灾 (in Chinese). Southcn. July 10, 2015. Retrieved July 10, 2015. ^ "RSMC Tropical Cyclone Advisory 030000". Japan Meteorological Agency. Archived from the original on July 3, 2015. Retrieved July 16, 2015. ^ "Prognostic Reasoning for Tropical Depression 11W (Eleven) Warning Nr 001". Joint Typhoon Warning Center. Archived from the original on July 17, 2015. Retrieved July 16, 2015. ^ "RSMC Tropical Cyclone Advisory 031800". Japan Meteorological Agency. Archived from the original on July 6, 2015. Retrieved July 16, 2015. ^ "RSMC Tropical Cyclone Advisory 051200". Japan Meteorological Agency. Archived from the original on July 6, 2015. Retrieved July 16, 2015. ^ "Prognostic Reasoning for Tropical Storm 11W (Nangka) Warning Nr 09". Joint Typhoon Warning Center. Archived from the original on July 8, 2015. Retrieved July 16, 2015. ^ "Prognostic Reasoning for Typhoon 11W (Nangka) Warning Nr 12". Joint Typhoon Warning Center. Archived from the original on July 8, 2015. Retrieved July 16, 2015. ^ "RSMC Tropical Cyclone Advisory 061200". Japan Meteorological Agency. Archived from the original on July 6, 2015. Retrieved July 16, 2015. ^ "RSMC Tropical Cyclone Advisory 071200". Japan Meteorological Agency. Archived from the original on July 7, 2015. Retrieved July 16, 2015. ^ "Prognostic Reasoning for Typhoon 11W (Nangka) Warning Nr 17". Joint Typhoon Warning Center. Archived from the original on July 8, 2015. Retrieved July 16, 2015. ^ "Prognostic Reasoning for Typhoon 11W (Nangka) Warning Nr 19". Joint Typhoon Warning Center. Archived from the original on July 8, 2015. Retrieved July 16, 2015. ^ "Prognostic Reasoning for Typhoon 11W (Nangka) Warning Nr 21". Joint Typhoon Warning Center. Archived from the original on July 8, 2015. Retrieved July 30, 2015. ^ "Prognostic Reasoning for Typhoon 11W (Nangka) Warning Nr 22". Joint Typhoon Warning Center. Archived from the original on July 8, 2015. Retrieved July 30, 2015. ^ "Prognostic Reasoning for Typhoon 11W (Nangka) Warning Nr 26". Joint Typhoon Warning Center. Archived from the original on July 10, 2015. Retrieved July 30, 2015. ^ "RSMC Tropical Cyclone Advisory 061200". Japan Meteorological Agency. Archived from the original on July 9, 2015. Retrieved July 30, 2015. ^ "Prognostic Reasoning for Typhoon 11W (Nangka) Warning Nr 28". Joint Typhoon Warning Center. Archived from the original on July 10, 2015. Retrieved July 30, 2015. ^ "Prognostic Reasoning for Typhoon 11W (Nangka) Warning Nr 37". Joint Typhoon Warning Center. Archived from the original on July 12, 2015. Retrieved July 30, 2015. ^ "Prognostic Reasoning for Typhoon 11W (Nangka) Warning Nr 39". Joint Typhoon Warning Center. Archived from the original on July 14, 2015. Retrieved July 30, 2015. ^ "Prognostic Reasoning for Typhoon 11W (Nangka) Warning Nr 43". Joint Typhoon Warning Center. Archived from the original on July 14, 2015. Retrieved July 30, 2015. ^ "Prognostic Reasoning for Typhoon 11W (Nangka) Warning Nr 44". Joint Typhoon Warning Center. Archived from the original on July 14, 2015. Retrieved July 30, 2015. ^ a b 平成２７年　台風第１１号に関する情報　第４５号 (in Japanese). Japan Meteorological Agency. Archived from the original on July 16, 2015. Retrieved August 21, 2016. ^ "STS 1511 Nangka (1511) Downgraded from TY". Japan Meteorological Agency. Archived from the original on July 17, 2015. Retrieved July 30, 2015. ^ 平成２７年　台風第１１号に関する情報　第５５号 (in Japanese). Japan Meteorological Agency. Archived from the original on July 17, 2015. Retrieved July 16, 2015. ^ "Prognostic Reasoning for Tropical Storm 11W (Nangka) Warning Nr 58". Joint Typhoon Warning Center. Archived from the original on July 17, 2015. Retrieved July 30, 2015. ^ "TD Downgraded from TS 1511 Nangka (1511)". Japan Meteorological Agency. Archived from the original on July 17, 2015. Retrieved July 30, 2015. ^ "Tropical Depression 11W (Nangka) Warning Nr 59". Joint Typhoon Warning Center. Archived from the original on July 20, 2015. Retrieved July 30, 2015. ^ "Warning and Summary 181200". Japan Meteorological Agency. Archived from the original on July 21, 2015. Retrieved July 30, 2015. ^ a b "Chaotic unseasonal storms strike Marshall Islands and Guam as eight systems threaten western Pacific". Australian Broadcasting Corporation. Agence France-Presse. July 4, 2015. Retrieved July 4, 2015. ^ a b c d Typhoon Halola (RSMC Tropical Cyclone Best Track). Japan Meteorological Agency. August 25, 2014. Archived from the original on January 19, 2015. Retrieved August 29, 2014. ^ "Prognostic Reasoning for Typhoon 01C (Halola) Warning Nr 16". Joint Typhoon Warning Center. Archived from the original on July 14, 2015. Retrieved July 25, 2015. ^ "Prognostic Reasoning for Typhoon 01C (Halola) Warning Nr 18". Joint Typhoon Warning Center. Archived from the original on July 14, 2015. Retrieved July 25, 2015. ^ "TY 1512 HALOLA (1512)". July 14, 2015. Archived from the original on July 14, 2015. ^ "Prognostic Reasoning for Typhoon 01C (Halola) Warning Nr 20". Joint Typhoon Warning Center. Archived from the original on July 16, 2015. Retrieved July 25, 2015. ^ "Prognostic Reasoning for Typhoon 01C (Halola) Warning Nr 21". Joint Typhoon Warning Center. Archived from the original on July 16, 2015. Retrieved July 25, 2015. ^ "RSMC Tropical Cyclone Advisory 180600". Japan Meteorological Agency. Archived from the original on July 19, 2015. Retrieved July 25, 2015. ^ "Prognostic Reasoning for Tropical Depression 01C (Halola) Warning Nr 32". Joint Typhoon Warning Center. Archived from the original on July 21, 2015. Retrieved July 25, 2015. ^ "TD 1512 HALOLA (1512)". Japan Meteorological Agency. Archived from the original on July 21, 2015. Retrieved July 19, 2015. ^ "Prognostic Reasoning for Tropical Depression 01C (Halola) Warning Nr 37". Joint Typhoon Warning Center. Archived from the original on July 21, 2015. Retrieved July 19, 2015. ^ "Prognostic Reasoning for Tropical Storm 01C (Halola) Warning Nr 40". Joint Typhoon Warning Center. Archived from the original on July 21, 2015. Retrieved July 20, 2015. ^ "TS 1512 HALOLA (1512) UPGRADED FROM TD". Japan Meteorological Agency. Archived from the original on July 21, 2015. Retrieved July 20, 2015. ^ "RSMC Tropical Cyclone Advisory 210000". Japan Meteorological Agency. Archived from the original on July 21, 2015. Retrieved July 25, 2015. ^ "Prognostic Reasoning for Tropical Storm 01C (Halola) Warning Nr 44". Joint Typhoon Warning Center. Archived from the original on July 21, 2015. Retrieved July 25, 2015. ^ "Prognostic Reasoning for Typhoon 01C (Halola) Warning Nr 45". Joint Typhoon Warning Center. Archived from the original on July 21, 2015. Retrieved July 25, 2015. ^ "Prognostic Reasoning for Typhoon 01C (Halola) Warning Nr 49". Joint Typhoon Warning Center. Archived from the original on July 22, 2015. Retrieved July 25, 2015. ^ "Prognostic Reasoning for Typhoon 01C (Halola) Warning Nr 51". Joint Typhoon Warning Center. Archived from the original on July 24, 2015. Retrieved July 25, 2015. ^ "BAGYONG GORING – Typhoon Halola set to enter PAR Thursday – Pagasa". InterAksyon.com. Archived from the original on July 25, 2015. ^ "Tropical Cyclone Alert: Typhoon "Goring" Severe Weather Bulletin #1". Philippine Atmospheric, Geophysical and Astronomical Services Administration. Archived from the original on July 26, 2015. Retrieved July 29, 2015. ^ "Prognostic Reasoning for Typhoon 01C (Halola) Warning Nr 57". Joint Typhoon Warning Center. Archived from the original on July 24, 2015. Retrieved July 25, 2015. ^ "Tropical Storm 01C (Halola) Warning Nr 61". Joint Typhoon Warning Center. Archived from the original on July 26, 2015. Retrieved July 25, 2015. ^ 平成２７年　台風第１２号に関する情報　第９４号 (in Japanese). Japan Meteorological Agency. Archived from the original on July 26, 2015. Retrieved July 26, 2015. ^ 台風１２号、キビ被害１億５４００万　南北大東 (in Japanese). The Ryukyu Shimpo. July 28, 2015. Retrieved July 29, 2015. ^ "JMA WWJP25 Warning and Summary July 23, 2015 00z". Japan Meteorological Agency. July 23, 2015. Archived from the original on July 24, 2015. Retrieved July 24, 2015. ^ "Prognostic Reasoning for Tropical Depression 12W Warning Nr 1 July 23, 2015 09z". Joint Typhoon Warning Center. July 23, 2015. Archived from the original on July 24, 2015. Retrieved July 24, 2015. ^ "Prognostic Reasoning for Tropical Depression 12W Warning Nr 3 July 23, 2015 21z". Joint Typhoon Warning Center. July 24, 2015. Archived from the original on July 27, 2015. Retrieved July 24, 2015. ^ a b "Prognostic Reasoning for Tropical Storm 12W Warning Nr 5 July 24, 2015 09z". Joint Typhoon Warning Center. July 24, 2015. Archived from the original on July 26, 2015. Retrieved July 24, 2015. ^ a b "JTWC 2015 best track analysis: Tropical Storm 12W" (DAT). United States Joint Typhoon Warning Center. Retrieved July 9, 2016. ^ a b "Prognostic Reasoning for Tropical Depression 12W Warning Nr 008". Joint Typhoon Warning Center. July 25, 2015. Archived from the original on July 26, 2015. Retrieved July 25, 2015. ^ "Tropical Depression 12W Warning Nr 009 July 25, 2015 09z". Joint Typhoon Warning Center. July 25, 2015. Archived from the original on July 26, 2015. Retrieved July 25, 2015. ^ "JMA WWJP25 Warning and Summary July 29, 2015 18z". Japan Meteorological Agency. July 29, 2015. Archived from the original on July 30, 2015. Retrieved August 2, 2015. ^ a b "Prognostic Reasoning for Tropical Depression 13W (Thirteen) Warning Nr 01". Joint Typhoon Warning Center. Archived from the original on July 30, 2015. Retrieved July 30, 2015. ^ "Prognostic Reasoning for Tropical Storm 13W (Soudelor) Warning Nr 10". Joint Typhoon Warning Center. August 1, 2015. Archived from the original on August 1, 2015. Retrieved July 31, 2015. ^ "Tropical Cyclone Advisory for Typhoon Soudelor (040806)". Japan Meteorological Agency. August 4, 2015. Archived from the original on August 4, 2015. Retrieved August 4, 2015. ^ "Detailed Track Information for Typhoon Soudelor (201513)". Digital Typhoon. August 5, 2015. Retrieved August 5, 2015. ^ Dimacali, TJ (August 5, 2015). "Soudelor enters PAR; Rainy weekend seen in Luzon, Visayas". GMA News. Retrieved August 5, 2015. ^ "Prognostic Reasoning for Typhoon 13W (Soudelor) Warning Nr 32". Joint Typhoon Warning Center. August 7, 2015. Archived from the original on August 7, 2015. Retrieved August 7, 2015. ^ "Tracking Data for Super Typhoon Soudelor". Unisys Weather. Retrieved August 7, 2015. ^ a b "Soudelor reclassified as Category 4". October 11, 2015. ^ "JMA WWJP25 Warning and Summary August 1, 2015 06z". Japan Meteorological Agency. August 1, 2015. Archived from the original on August 2, 2015. Retrieved August 4, 2015. ^ a b "Significant Tropical Weather Advisory for the Western and South Pacific Oceans August 1, 2015 06z". United States Joint Typhoon Warning Center. Archived from the original on August 2, 2015. Retrieved July 31, 2016. ^ "Prognostic Reasoning for Tropical Depression 14W (Fourteen) Warning Nr 02". Joint Typhoon Warning Center. Archived from the original on August 2, 2015. Retrieved August 2, 2015. ^ "Tropical Depression 14W Warning Nr 010 (Final) 041500z". Joint Typhoon Warning Center. August 4, 2015. Archived from the original on August 4, 2015. Retrieved August 4, 2015. ^ a b c "RSMC Tropical Cyclone Best Track: Typhoon Molave". Japan Meteorological Agency. September 25, 2015. Archived from the original on September 25, 2015. ^ a b "Significant Tropical Weather Advisory for the Western and South Pacific Oceans August 5, 2015 22z". Joint Typhoon Warning Center. Archived from the original on August 8, 2015. Retrieved August 15, 2015. ^ "Tropical Cyclone Formation Alert: August 6, 05z". Joint Typhoon Warning Center. Archived from the original on August 6, 2015. Retrieved August 15, 2015. ^ "Prognostic Reasoning for Tropical Depression 15W Warning Nr 01". Joint Typhoon Warning Center. August 7, 2015. Archived from the original on August 7, 2015. Retrieved August 7, 2015. ^ "Tropical Cyclone Advisory for Analysis and Forecast 2015-08-07T12:00:00Z". Japan Meteorological Agency. Retrieved August 7, 2015. ^ "Prognostic Reasoning for Tropical Depression 15W (Fifteen) Warning Nr 01". Joint Typhoon Warning Center. August 7, 2015. Archived from the original on August 8, 2015. ^ "Prognostic Reasoning for Tropical Depression 15W (Fifteen) Warning Nr 02". Joint Typhoon Warning Center. August 7, 2015. Archived from the original on August 8, 2015. ^ "Prognostic Reasoning for Tropical Storm 15W (Molave) Warning Nr 06". Joint Typhoon Warning Center. August 8, 2015. Archived from the original on August 11, 2015. ^ "Prognostic Reasoning for Tropical Storm 15W (Molave) Warning Nr 10". Joint Typhoon Warning Center. August 9, 2015. Archived from the original on August 11, 2015. ^ "Tropical Depression 15W (Molave) Warning Nr 011". Joint Typhoon Warning Center. August 9, 2015. Archived from the original on August 11, 2015. ^ "Prognostic Reasoning for Tropical Storm 15W (Molave) Warning Nr 12". Joint Typhoon Warning Center. August 11, 2015. Archived from the original on August 11, 2015. ^ "Tropical Storm 15W (Molave) Warning Nr 012". Joint Typhoon Warning Center. August 11, 2015. Archived from the original on August 11, 2015. ^ "Prognostic Reasoning for Tropical Storm 15W (Molave) Warning Nr 15". Joint Typhoon Warning Center. August 12, 2015. Archived from the original on August 14, 2015. ^ "Prognostic Reasoning for Tropical Storm 15W (Molave) Warning Nr 18". Joint Typhoon Warning Center. August 12, 2015. Archived from the original on August 14, 2015. ^ "Prognostic Reasoning for Tropical Storm 15W (Molave) Warning Nr 19A Amended". Joint Typhoon Warning Center. August 13, 2015. Archived from the original on August 14, 2015. ^ "Tropical Storm 15W (Molave) Warning Nr 022". Joint Typhoon Warning Center. August 13, 2015. Archived from the original on August 14, 2015. ^ "JMA Tropical Cyclone Advisory August 13, 2015 18z". Japan Meteorological Agency. August 13, 2015. Archived from the original on August 14, 2015. Retrieved August 15, 2015. ^ "Tropical Depression 16W (Sixteen) Warning Nr 001". Joint Typhoon Warning Center. August 14, 2015. Archived from the original on August 14, 2015. ^ "Prognostic Reasoning for Tropical Storm 16W (Goni) Warning Nr 04". Joint Typhoon Warning Center. Archived from the original on August 15, 2015. Retrieved August 14, 2015. ^ "TS 1515 GONI (1515) UPGRADED FROM TD". Japan Meteorological Agency. August 14, 2015. Archived from the original on August 15, 2015. ^ "STS 1515 GONI (1515) UPGRADED FROM TS". Japan Meteorological Agency. Archived from the original on August 15, 2015. Retrieved August 15, 2015. ^ "Prognostic Reasoning for Tropical Storm 16W (Goni) Warning Nr 05". Joint Typhoon Warning Center. Archived from the original on August 15, 2015. Retrieved August 15, 2015. ^ "Prognostic Reasoning for Tropical Storm 16W (Goni) Warning Nr 09". Joint Typhoon Warning Center. Archived from the original on August 16, 2015. Retrieved August 16, 2015. ^ "Prognostic Reasoning for Typhoon 16W (Goni) Warning Nr 11". Joint Typhoon Warning Center. Archived from the original on August 16, 2015. Retrieved August 16, 2015. ^ "TY 1515 GONI (1515) UPGRADED FROM STS". Japan Meteorological Agency. Archived from the original on August 16, 2015. Retrieved August 16, 2015. ^ "Prognostic Reasoning for Typhoon 16W (Goni) Warning Nr 13". Joint Typhoon Warning Center. Archived from the original on August 17, 2015. Retrieved August 17, 2015. ^ "Prognostic Reasoning for Typhoon 16W (Goni) Warning Nr 16". Joint Typhoon Warning Center. Archived from the original on August 18, 2015. Retrieved August 17, 2015. ^ "Typhoon 'Ineng' enters PAR". Inquirer.net. August 18, 2015. ^ "Prognostic Reasoning for Typhoon 16W (Goni) Warning Nr 22". Joint Typhoon Warning Center. Archived from the original on August 19, 2015. Retrieved August 19, 2015. ^ "Significant Tropical Weather Advisory for the Western Pacific Ocean". Joint Typhoon Warning Center. August 12, 2015. Archived from the original on August 14, 2015. ^ "WTPQ21 RJTD 140600". Japan Meteorological Agency. Archived from the original on August 14, 2015. Retrieved August 14, 2015. ^ "Prognostic Reasoning for Tropical Depression 17W (Seventeen) Warning Nr 01". Joint Typhoon Warning Center. Archived from the original on August 15, 2015. Retrieved August 14, 2015. ^ "TS 1516 ATSANI (1516) UPGRADED FROM TD". Japan Meteorological Agency. Archived from the original on August 15, 2015. Retrieved August 14, 2015. ^ "Prognostic Reasoning for Typhoon 17W (Atsani) Warning 09". Joint Typhoon Warning Center. Archived from the original on August 16, 2015. Retrieved August 16, 2015. ^ "TY 1516 ATSANI (1516) UPGRADED FROM STS". Japan Meteorological Agency. Archived from the original on August 16, 2015. Retrieved August 16, 2015. ^ "Prognostic Reasoning for Typhoon 17W (Atsani) Warning 12". Joint Typhoon Warning Center. Archived from the original on August 17, 2015. Retrieved August 17, 2015. ^ "Prognostic Reasoning for Typhoon 17W (Atsani) Warning 15". Joint Typhoon Warning Center. Archived from the original on August 18, 2015. Retrieved August 17, 2015. ^ "Prognostic Reasoning for Typhoon 17W (Atsani) Warning 16". Joint Typhoon Warning Center. Archived from the original on August 18, 2015. Retrieved August 18, 2015. ^ "Prognostic Reasoning for Super Typhoon 17W (Atsani) Warning 20". Joint Typhoon Warning Center. Archived from the original on August 19, 2015. Retrieved August 19, 2015. ^ "Prognostic Reasoning for Super Typhoon 17W (Atsani) Warning 22". Joint Typhoon Warning Center. Archived from the original on August 19, 2015. Retrieved August 19, 2015. ^ "Prognostic Reasoning for Super Typhoon 17W (Atsani) Warning 26". Joint Typhoon Warning Center. Archived from the original on August 19, 2015. Retrieved August 20, 2015. ^ "Prognostic Reasoning for Typhoon 17W (Atsani) Warning 26". Joint Typhoon Warning Center. Archived from the original on August 21, 2015. Retrieved August 20, 2015. ^ "Prognostic Reasoning for Typhoon 17W (Atsani) Warning 27". Joint Typhoon Warning Center. Archived from the original on August 21, 2015. Retrieved August 21, 2015. ^ "Prognostic Reasoning for Typhoon 17W (Atsani) Warning 28". Joint Typhoon Warning Center. Archived from the original on August 21, 2015. Retrieved August 21, 2015. ^ "Prognostic Reasoning for Typhoon 17W (Atsani) Warning 30". Joint Typhoon Warning Center. Archived from the original on August 21, 2015. Retrieved August 21, 2015. ^ "Prognostic Reasoning for Typhoon 17W (Atsani) Warning 31". Joint Typhoon Warning Center. Archived from the original on August 21, 2015. Retrieved August 21, 2015. ^ "Prognostic Reasoning for Typhoon 17W (Atsani) Warning 33". Joint Typhoon Warning Center. Archived from the original on August 22, 2015. Retrieved August 22, 2015. ^ "Prognostic Reasoning for Typhoon 17W (Atsani) Warning 39". Joint Typhoon Warning Center. Archived from the original on August 23, 2015. Retrieved August 23, 2015. ^ "STS 1516 ATSANI (1516) DOWNGRADED FROM TY". Japan Meteorological Agency. Archived from the original on August 24, 2015. Retrieved August 24, 2015. ^ "Prognostic Reasoning for Tropical Storm 17W (Atsani) Warning 42". Joint Typhoon Warning Center. Archived from the original on August 24, 2015. Retrieved August 24, 2015. ^ "Prognostic Reasoning for Tropical Storm 17W (Atsani) Warning 43". Joint Typhoon Warning Center. Archived from the original on August 26, 2015. Retrieved August 24, 2015. ^ "Typhoon Best Track 2015-10-08T02:00:00Z « WIS Portal – GISC Tokyo". Retrieved December 14, 2015. ^ a b Typhoon Kilo (RSMC Tropical Cyclone Best Track). Japan Meteorological Agency. October 20, 2015. Archived from the original on April 21, 2015. Retrieved July 31, 2016. ^ "Prognostic Reasoning for Typhoon 03C (Kilo) Warning Nr 47". Joint Typhoon Warning Center. Archived from the original on September 2, 2015. Retrieved September 1, 2015. ^ "Prognostic Reasoning for Typhoon 03C (Kilo) Warning Nr 50". Joint Typhoon Warning Center. Archived from the original on September 2, 2015. Retrieved September 2, 2015. ^ "Prognostic Reasoning for Typhoon 03C (Kilo) Warning Nr 55". Joint Typhoon Warning Center. Archived from the original on September 3, 2015. Retrieved September 3, 2015. ^ "Prognostic Reasoning for Typhoon 03C (Kilo) Warning Nr 59". Joint Typhoon Warning Center. Archived from the original on September 4, 2015. Retrieved September 3, 2015. ^ "TY 1517 KILO (1517)". Japan Meteorological Agency. Archived from the original on September 4, 2015. Retrieved September 4, 2015. ^ "Prognostic Reasoning for Typhoon 03C (Kilo) Warning Nr 65". Joint Typhoon Warning Center. Archived from the original on September 5, 2015. Retrieved September 5, 2015. ^ "Prognostic Reasoning for Typhoon 03C (Kilo) Warning Nr 67". Joint Typhoon Warning Center. Archived from the original on September 6, 2015. Retrieved September 5, 2015. ^ "Prognostic Reasoning for Typhoon 03C (Kilo) Warning Nr 70". Joint Typhoon Warning Center. Archived from the original on September 7, 2015. Retrieved September 7, 2015. ^ "Prognostic Reasoning for Typhoon 03C (Kilo) Warning Nr 71". Joint Typhoon Warning Center. Archived from the original on September 7, 2015. Retrieved September 7, 2015. ^ "Prognostic Reasoning for Typhoon 03C (Kilo) Warning Nr 73". Joint Typhoon Warning Center. Archived from the original on September 9, 2015. Retrieved September 7, 2015. ^ "Prognostic Reasoning for Typhoon 03C (Kilo) Warning Nr 77". Joint Typhoon Warning Center. Archived from the original on September 9, 2015. Retrieved September 8, 2015. ^ "STS 1517 KILO (1517) DOWNGRADED FROM TY". Japan Meteorological Agency. Archived from the original on September 9, 2015. Retrieved September 9, 2015. ^ "Prognostic Reasoning for Typhoon 03C (Kilo) Warning Nr 81". Joint Typhoon Warning Center. Archived from the original on September 10, 2015. Retrieved September 9, 2015. ^ "Prognostic Reasoning for Tropical Storm 03C (Kilo) Warning Nr 84". Joint Typhoon Warning Center. Archived from the original on September 10, 2015. Retrieved September 10, 2015. ^ "Prognostic Reasoning for Tropical Storm 03C (Kilo) Warning Nr 85". Joint Typhoon Warning Center. Archived from the original on September 10, 2015. Retrieved September 10, 2015. ^ "Tropical Storm 03C (Kilo) Warning Nr 086". Joint Typhoon Warning Center. Archived from the original on September 11, 2015. Retrieved September 11, 2015. ^ "DEVELOPING LOW FORMER STS 1517 KILO (1517)". Japan Meteorological Agency. Archived from the original on September 11, 2015. Retrieved September 11, 2015. ^ a b "RSMC TROPICAL CYCLONE BEST TRACK 1518 ETAU (1518)". Japan Meteorological Agency. October 21, 2015. ^ "Prognostic Reasoning Tropical Depression 18W (Eighteen) Warning Nr 01". Joint Typhoon Warning Center. Archived from the original on September 6, 2015. Retrieved September 6, 2015. ^ "Prognostic Reasoning Tropical Depression 18W (Etau) Warning Nr 03". Joint Typhoon Warning Center. Archived from the original on September 7, 2015. Retrieved September 7, 2015. ^ "Prognostic Reasoning Tropical Storm 18W (Etau) Warning Nr 04". Joint Typhoon Warning Center. Archived from the original on September 9, 2015. Retrieved September 7, 2015. ^ "Prognostic Reasoning Tropical Storm 18W (Etau) Warning Nr 05". Joint Typhoon Warning Center. Archived from the original on September 9, 2015. Retrieved September 8, 2015. ^ "STS 1518 ETAU (1518) UPGRADED FROM TS". Japan Meteorological Agency. Archived from the original on September 9, 2015. Retrieved September 8, 2015. ^ "Prognostic Reasoning Tropical Storm 18W (Etau) Warning Nr 08". Joint Typhoon Warning Center. Archived from the original on September 9, 2015. Retrieved September 8, 2015. ^ "Prognostic Reasoning Tropical Storm 18W (Etau) Warning Nr 09". Joint Typhoon Warning Center. Archived from the original on September 9, 2015. Retrieved September 8, 2015. ^ "TS 1518 ETAU (1518) DOWNGRADED FROM STS". Japan Meteorological Agency. Archived from the original on September 9, 2015. Retrieved September 9, 2015. ^ "Prognostic Reasoning Tropical Storm 18W (Etau) Warning Nr 10". Joint Typhoon Warning Center. Archived from the original on September 9, 2015. Retrieved September 9, 2015. ^ "DEVELOPING LOW FORMER TS 1518 ETAU (1518)". Japan Meteorological Agency. Archived from the original on September 9, 2015. Retrieved September 9, 2015. ^ a b Nick Wiltgen (September 10, 2015). "Japan Issues Third Emergency Warning as Flood, Landslide Dangers Spread North; At Least 1 Dead, 25 Missing". The Weather Channel. Retrieved September 11, 2015. ^ Will Ripley & Euan McKirdy (September 11, 2015). "Japan flooding: 3 deaths, dozens missing in deluge". Tokyo, Japan: CNN. Retrieved September 11, 2015. ^ "台風１８号による被害金額　約１１７億円に". 日テレNEWS24 (in Japanese). Nippon News Network. September 18, 2015. Retrieved September 20, 2015. ^ "Экс-тропический шторм "Атау" обрушил на Приморье очень сильный дождь" (in Russian). Gismeteo. September 10, 2015. Retrieved September 11, 2015. ^ "ABPW10 PGTW 110300". Joint Typhoon Warning Center. Archived from the original on September 13, 2015. Retrieved September 11, 2015. ^ "WTPQ20 RJTD 130600". Japan Meteorological Agency. Archived from the original on September 13, 2015. Retrieved September 13, 2015. ^ "Prognostic Reasoning for Tropical Depression 19W (Nineteen) Warning Nr 01". Joint Typhoon Warning Center. Archived from the original on September 13, 2015. Retrieved September 13, 2015. ^ "Tropical Depression 19W (Nineteen) Warning Nr 001". Joint Typhoon Warning Center. Archived from the original on September 13, 2015. Retrieved September 13, 2015. ^ "TS 1519 VAMCO (1519) UPGRADED FROM TD". Japan Meteorological Agency. Archived from the original on September 13, 2015. Retrieved September 13, 2015. ^ "Tropical Storm 19W (Vamco) Warning Nr 002". Joint Typhoon Warning Center. Archived from the original on September 13, 2015. Retrieved September 13, 2015. ^ "Prognostic Reasoning for Tropical Storm 19W (Vamco) Warning Nr 04". Joint Typhoon Warning Center. Archived from the original on September 16, 2015. Retrieved September 14, 2015. ^ "Tropical Storm 19W (Vamco) Warning Nr 005". Joint Typhoon Warning Center. Archived from the original on September 16, 2015. Retrieved September 14, 2015. ^ "TD DOWNGRADED FROM TS 1519 VAMCO (1519)". Japan Meteorological Agency. Archived from the original on September 16, 2015. Retrieved September 15, 2015. ^ "Tropical Rainstorm Vamco Unleashes Flooding in Vietnam, Laos and Cambodia". AccuWeather. Retrieved December 14, 2015. ^ a b Hoàng Phan (September 19, 2015). "11 người chết, 1 người mất tích do bão số 3" (in Vietnamese). Thanh Nien Daily. Retrieved September 20, 2015. ^ Hồng Long (September 18, 2015). "Đảo Lý Sơn thiệt hại hàng tỷ đồng do bão số 3" (in Vietnamese). Dân Trí. Retrieved September 19, 2015. ^ "Điện lực miền Trung thiệt hại hàng tỷ đồng vì bão số 3" (in Vietnamese). VinaNet. September 16, 2015. Retrieved September 19, 2015. ^ "Bão số 3 gây thiệt hại về nông sản và sạt lở một số địa phương" (in Vietnamese). Quảng Nam Online. September 15, 2015. Retrieved September 19, 2015. ^ a b Thủy (September 21, 2015). "Thanh Hóa: Mưa lũ làm thiệt hại khoảng 287 tỷ đồng" (in Vietnamese). Vietnamese Natural Resources and Environment Newspaper. Retrieved September 21, 2015. ^ "Thousands Affected by Kampot Floods". Phnom Penh, Cambodia: Khmer Times. September 17, 2015. Retrieved September 19, 2015. ^ a b "Vamco readies parting shot at 9 provinces". Bangkok Post. September 18, 2015. Retrieved September 19, 2015. ^ a b c "East, South still fighting floods". The Sunday Nation. Bangkok, Thailand. September 20, 2015. Archived from the original on September 20, 2015. Retrieved September 20, 2015. ^ a b "Phetchaburi fishermen's bodies found". Phetchaburi, Thailand: Bangkok Post. September 19, 2015. Retrieved September 19, 2015. ^ "ABPW10 PGTW 131600". Joint Typhoon Warning Center. Archived from the original on September 13, 2015. Retrieved September 13, 2015. ^ "WTPN21 PGTW 131930". Joint Typhoon Warning Center. Archived from the original on September 13, 2015. Retrieved September 13, 2015. ^ "Tropical Depression 20W (Twenty) Warning Nr 001". Joint Typhoon Warning Center. Archived from the original on September 16, 2015. Retrieved September 14, 2015. ^ "Prognostic reasoning for Tropical Storm 20W (Twenty) Warning Nr 04". Joint Typhoon Warning Center. Archived from the original on September 16, 2015. Retrieved September 15, 2015. ^ "TS 1520 KROVANH (1520) UPGRADED FROM TD". Japan Meteorological Agency. Archived from the original on September 16, 2015. Retrieved September 15, 2015. ^ "Prognostic reasoning for Tropical Storm 20W (Krovanh) Warning Nr 06". Joint Typhoon Warning Center. Archived from the original on September 16, 2015. Retrieved September 16, 2015. ^ "STS 1520 KROVANH (1520) UPGRADED FROM TS". Japan Meteorological Agency. Archived from the original on September 16, 2015. Retrieved September 16, 2015. ^ "Prognostic reasoning for Tropical Storm 20W (Krovanh) Warning Nr 08". Joint Typhoon Warning Center. Archived from the original on September 16, 2015. Retrieved September 16, 2015. ^ "TY 1520 KROVANH (1520) UPGRADED FROM STS". Japan Meteorological Agency. Archived from the original on September 17, 2015. Retrieved September 16, 2015. ^ "Typhoon 20W (Krovanh) Warning Nr 009". Joint Typhoon Warning Center. Archived from the original on September 17, 2015. Retrieved September 16, 2015. ^ "Prognostic reasoning for Typhoon 20W (Krovanh) Warning Nr 10". Joint Typhoon Warning Center. Archived from the original on September 17, 2015. Retrieved September 17, 2015. ^ "Prognostic reasoning for Typhoon 20W (Krovanh) Warning Nr 12". Joint Typhoon Warning Center. Archived from the original on September 17, 2015. Retrieved September 17, 2015. ^ "Prognostic reasoning for Typhoon 20W (Krovanh) Warning Nr 13". Joint Typhoon Warning Center. Archived from the original on September 23, 2015. Retrieved September 17, 2015. ^ "Prognostic reasoning for Tropical Storm 20W (Krovanh) Warning Nr 20". Joint Typhoon Warning Center. Archived from the original on September 23, 2015. Retrieved September 19, 2015. ^ "STS 1520 KROVANH (1520) DOWNGRADED FROM TY". Japan Meteorological Agency. ^ "Prognostic reasoning for Tropical Storm 20W (Krovanh) Warning Nr 23". Joint Typhoon Warning Center. Archived from the original on September 23, 2015. Retrieved September 20, 2015. ^ "TS 1520 KROVANH (1520) DOWNGRADED FROM STS". Japan Meteorological Agency. Archived from the original on September 23, 2015. Retrieved September 20, 2015. ^ "Tropical Storm 20W (Krovanh) Warning Nr 024". Joint Typhoon Warning Center. Archived from the original on September 23, 2015. Retrieved September 20, 2015. ^ "DEVELOPING LOW FORMER TS 1520 KROVANH (1520)". Japan Meteorological Agency. Archived from the original on September 23, 2015. Retrieved September 20, 2015. ^ a b "RSMC TROPICAL CYCLONE BEST TRACK 1520 KROVANH (1520)". Japan Meteorological Agency. November 12, 2015. ^ "ABPW10 PGTW 170600". Joint Typhoon Warning Center. Archived from the original on September 17, 2015. Retrieved September 17, 2015. ^ "WTPQ20 RJTD 211200". Japan Meteorological Agency. Archived from the original on September 23, 2015. Retrieved September 21, 2015. ^ "Prognostic Reasoning for Tropical Depression 21W (Twentyone) Warning Nr 01". Joint Typhoon Warning Center. Archived from the original on September 23, 2015. Retrieved September 21, 2015. ^ "Prognostic Reasoning for Tropical Depression 21W (Twentyone) Warning Nr 03". Joint Typhoon Warning Center. Archived from the original on September 23, 2015. Retrieved September 22, 2015. ^ "TS 1521 DUJUAN (1521) UPGRADED FROM TD". Japan Meteorological Agency. Archived from the original on September 23, 2015. Retrieved September 22, 2015. ^ "Prognostic Reasoning for Tropical Storm 21W (Dujuan) Warning Nr 06". Joint Typhoon Warning Center. Archived from the original on September 23, 2015. Retrieved September 23, 2015. ^ "Tropical Storm 'Jenny' enters PH, to enhance 'habagat'". Inquirer.net. Retrieved September 23, 2015. ^ "Prognostic Reasoning for Tropical Storm 21W (Dujuan) Warning Nr 11". Joint Typhoon Warning Center. Archived from the original on September 25, 2015. Retrieved September 24, 2015. ^ "STS 1521 DUJUAN (1521) UPGRADED FROM TS". Japan Meteorological Agency. Archived from the original on September 25, 2015. Retrieved September 24, 2015. ^ "Prognostic Reasoning for Typhoon 21W (Dujuan) Warning Nr 14". Joint Typhoon Warning Center. Archived from the original on September 25, 2015. Retrieved September 25, 2015. ^ "TY 1521 DUJUAN (1521) UPGRADED FROM STS". Japan Meteorological Agency. Archived from the original on September 25, 2015. Retrieved September 25, 2015. ^ "Prognostic Reasoning for Typhoon 21W (Dujuan) Warning Nr 21". Joint Typhoon Warning Center. Archived from the original on September 27, 2015. Retrieved September 26, 2015. ^ "Prognostic Reasoning for Typhoon 21W (Dujuan) Warning Nr 22". Joint Typhoon Warning Center. Archived from the original on September 27, 2015. Retrieved September 27, 2015. ^ "Prognostic Reasoning for Typhoon 21W (Dujuan) Warning Nr 23". Joint Typhoon Warning Center. Archived from the original on September 27, 2015. Retrieved September 27, 2015. ^ "TY 1521 DUJUAN (1521)". Japan Meteorological Agency. Archived from the original on September 27, 2015. Retrieved September 27, 2015. ^ "Prognostic Reasoning for Typhoon 21W (Dujuan) Warning Nr 24". Joint Typhoon Warning Center. Archived from the original on September 27, 2015. Retrieved September 27, 2015. ^ "Prognostic Reasoning for Typhoon 21W (Dujuan) Warning Nr 27". Joint Typhoon Warning Center. Archived from the original on September 29, 2015. Retrieved September 28, 2015. ^ "Prognostic Reasoning for Typhoon 21W (Dujuan) Warning Nr 28". Joint Typhoon Warning Center. Archived from the original on September 29, 2015. Retrieved September 28, 2015. ^ "Typhoon 21W (Dujuan) Warning Nr 030". Joint Typhoon Warning Center. Archived from the original on September 29, 2015. Retrieved September 29, 2015. ^ "中央气象台9月29日10时发布台风黄色预警" (in Chinese). National Meteorological Center. Archived from the original on September 29, 2015. Retrieved September 29, 2015. ^ "STS 1521 DUJUAN (1521) DOWNGRADED FROM TY". Japan Meteorological Agency. Archived from the original on September 29, 2015. Retrieved September 29, 2015. ^ "TS 1521 DUJUAN (1521) DOWNGRADED FROM STS". Japan Meteorological Agency. Archived from the original on September 29, 2015. Retrieved September 29, 2015. ^ "Typhoon Best Track 2015-11-12T06:00:00Z « WIS Portal – GISC Tokyo". Retrieved December 14, 2015. ^ "WWJP25 RJTD 300000". Japan Meteorological Agency. Archived from the original on October 1, 2015. Retrieved September 30, 2015. ^ "Tropical depression 'Kabayan': Signal No. 1 up in parts of Luzon". Inquirer.net. October 1, 2015. ^ "Tropical Depression 22W (Twentytwo) Warning Nr 001". Joint Typhoon Warning Center. Archived from the original on October 1, 2015. Retrieved October 1, 2015. ^ "TS 1522 MUJIGAE (1522) UPGRADED FROM TD". Japan Meteorological Agency. Archived from the original on October 2, 2015. Retrieved October 1, 2015. ^ "Tropical Storm 22W (Twentytwo) Warning Nr 003". Joint Typhoon Warning Center. Archived from the original on October 1, 2015. Retrieved October 1, 2015. ^ "Prognostic Reasoning for Tropical Depression 22W (Twentytwo) Warning Nr 04". Joint Typhoon Warning Center. Archived from the original on October 2, 2015. Retrieved October 2, 2015. ^ "Prognostic Reasoning for Tropical Storm 22W (Mujigae) Warning Nr 06". Joint Typhoon Warning Center. Archived from the original on October 2, 2015. Retrieved October 2, 2015. ^ "STS 1522 MUJIGAE (1522) UPGRADED FROM TS". Japan Meteorological Agency. Archived from the original on October 3, 2015. Retrieved October 2, 2015. ^ "Typhoon 22W (Mujigae) Warning Nr 011". Joint Typhoon Warning Center. Archived from the original on October 3, 2015. Retrieved October 3, 2015. ^ "TY 1522 MUJIGAE (1522) UPGRADED FROM STS". Japan Meteorological Agency. Archived from the original on October 3, 2015. Retrieved October 3, 2015. ^ "Prognostic Reasoning for Typhoon 22W (Mujigae) Warning Nr 14". Joint Typhoon Warning Center. Archived from the original on October 7, 2015. Retrieved October 4, 2015. ^ "TY 1522 MUJIGAE (1522)". Japan Meteorological Agency. Archived from the original on October 7, 2015. Retrieved October 3, 2015. ^ "Typhoon 22W (Mujigae) Warning Nr 015". Joint Typhoon Warning Center. Archived from the original on October 7, 2015. Retrieved October 4, 2015. ^ "STS 1522 MUJIGAE (1522) DOWNGRADED FROM TY". Japan Meteorological Agency. Archived from the original on October 7, 2015. Retrieved October 4, 2015. ^ "TS 1522 MUJIGAE (1522) DOWNGRADED FROM STS". Japan Meteorological Agency. Archived from the original on October 7, 2015. Retrieved October 4, 2015. ^ "TD 1522 MUJIGAE (1522) DOWNGRADED FROM TS". Japan Meteorological Agency. Archived from the original on October 7, 2015. Retrieved October 5, 2015. ^ "WTPQ21 RJTD 011200". Joint Typhoon Warning Center. Japan Meteorological Agency. Archived from the original on October 1, 2015. Retrieved October 1, 2015. ^ "TS 1523 CHOI-WAN (1523) UPGRADED FROM TD". Japan Meteorological Agency. Archived from the original on October 2, 2015. Retrieved October 2, 2015. ^ "Tropical Depression 23W (Choi-wan) Warning Nr 001". Joint Typhoon Warning Center. Archived from the original on October 3, 2015. Retrieved October 3, 2015. ^ "Prognostic Reasoning for Tropical Storm 23W (Choi-wan) Warning Nr 02". Joint Typhoon Warning Center. Archived from the original on October 3, 2015. Retrieved October 2, 2015. ^ "Prognostic Reasoning for Tropical Storm 23W (Choi-wan) Warning Nr 03". Joint Typhoon Warning Center. Archived from the original on October 3, 2015. Retrieved October 3, 2015. ^ "Prognostic Reasoning for Tropical Storm 23W (Choi-wan) Warning Nr 07". Joint Typhoon Warning Center. Archived from the original on October 7, 2015. Retrieved October 4, 2015. ^ "STS 1523 CHOI-WAN (1523) UPGRADED FROM TS". Japan Meteorological Agency. Archived from the original on October 7, 2015. Retrieved October 5, 2015. ^ "Prognostic Reasoning for Typhoon 23W (Choi-wan) Warning Nr 15". Joint Typhoon Warning Center. Archived from the original on October 7, 2015. Retrieved October 6, 2015. ^ "Prognostic Reasoning for Typhoon 23W (Choi-wan) Warning Nr 18". Joint Typhoon Warning Center. Archived from the original on October 7, 2015. Retrieved October 6, 2015. ^ "Prognostic Reasoning for Typhoon 23W (Choi-wan) Warning Nr 19". Joint Typhoon Warning Center. Archived from the original on October 7, 2015. Retrieved October 7, 2015. ^ "Prognostic Reasoning for Typhoon 23W (Choi-wan) Warning Nr 20". Joint Typhoon Warning Center. Archived from the original on October 7, 2015. Retrieved October 7, 2015. ^ "Prognostic Reasoning for Tropical Storm 23W (Choi-wan) Warning Nr 21". Joint Typhoon Warning Center. Archived from the original on October 7, 2015. Retrieved October 7, 2015. ^ "STS 1523 CHOI-WAN (1523)". Japan Meteorological Agency. Archived from the original on October 8, 2015. Retrieved October 8, 2015. ^ "DEVELOPING LOW FORMER STS 1523 CHOI-WAN (1523)". Japan Meteorological Agency. Archived from the original on October 8, 2015. Retrieved October 8, 2015. ^ "WWJP25 RJTD 111800". Japan Meteorological Agency. October 11, 2015. Archived from the original on October 12, 2015. ^ "Tropical Depression 24W (Twentyfour) Warning Nr 001". Joint Typhoon Warning Center. Archived from the original on October 13, 2015. Retrieved October 13, 2015. ^ "Prognostic Reasoning for Tropical Depression 24W (Twentyfour) Warning Nr 01". Joint Typhoon Warning Center. Archived from the original on October 13, 2015. Retrieved October 13, 2015. ^ "TS 1524 KOPPU (1524) UPGRADED FROM TD". Japan Meteorological Agency. October 13, 2015. Archived from the original on October 13, 2015. ^ "Tropical Storm 24W (Koppu) Warning Nr 003". Joint Typhoon Warning Center. Archived from the original on October 13, 2015. Retrieved October 13, 2015. ^ "Prognostic Reasoning for Tropical Storm 24W (Koppu) Warning Nr 05". Joint Typhoon Warning Center. Archived from the original on October 14, 2015. Retrieved October 14, 2015. ^ "Severe Weather Bulletin #1 on Tropical Storm "LANDO"". Philippine Atmospheric, Geophysical, Astronomical and Services Administration. October 14, 2015. Archived from the original on October 15, 2015. ^ "TY 1524 KOPPU (1524) UPGRADED FROM STS". Japan Meteorological Agency. October 15, 2015. Archived from the original on October 16, 2015. ^ "Prognostic Reasoning for Typhoon 24W (Koppu) Warning Nr 10". Joint Typhoon Warning Center. Archived from the original on October 16, 2015. Retrieved October 15, 2015. ^ "Prognostic Reasoning for Typhoon 24W (Koppu) Warning Nr 17". Joint Typhoon Warning Center. Archived from the original on October 17, 2015. Retrieved October 17, 2015. ^ "Prognostic Reasoning for Super Typhoon 24W (Koppu) Warning Nr 19". Joint Typhoon Warning Center. Archived from the original on October 17, 2015. Retrieved October 17, 2015. ^ "TY 1524 KOPPU (1524)". Japan Meteorological Agency. October 17, 2015. Archived from the original on October 18, 2015. ^ "Super Typhoon 24W (Koppu) Warning Nr 019". Joint Typhoon Warning Center. Archived from the original on October 17, 2015. Retrieved October 17, 2015. ^ a b c d e f g h Typhoon Champi (RSMC Tropical Cyclone Best Track). Japan Meteorological Agency. November 11, 2015. Archived from the original on April 21, 2015. Retrieved November 11, 2015. ^ "Prognostic Reasoning for Tropical Depression 25W October 13, 2015 09z". United States Joint Typhoon Warning Center. October 13, 2015. Archived from the original on October 13, 2015. ^ "Prognostic Reasoning for Tropical Storm 25W (Champi) Warning Nr 05". Joint Typhoon Warning Center. October 14, 2015. Archived from the original on October 14, 2015. ^ "Prognostic Reasoning for Tropical Storm 25W (Champi) Warning Nr 08". Joint Typhoon Warning Center. October 15, 2015. Archived from the original on October 15, 2015. ^ "Prognostic Reasoning for Typhoon 25W (Champi) Warning Nr 15". Joint Typhoon Warning Center. October 16, 2015. Archived from the original on October 17, 2015. ^ "Prognostic Reasoning for Typhoon 25W (Champi) Warning Nr 16". Joint Typhoon Warning Center. October 17, 2015. Archived from the original on October 17, 2015. ^ "Prognostic Reasoning for Typhoon 25W (Champi) Warning Nr 18". Joint Typhoon Warning Center. October 17, 2015. Archived from the original on October 17, 2015. ^ "Prognostic Reasoning for Super Typhoon 25W (Champi) Warning Nr 22". Joint Typhoon Warning Center. October 18, 2015. Archived from the original on October 18, 2015. ^ "Super Typhoon 25W (Champi) Warning Nr 022". Joint Typhoon Warning Center. October 18, 2015. Archived from the original on October 18, 2015. ^ "Prognostic Reasoning for Typhoon 25W (Champi) Warning Nr 25". Joint Typhoon Warning Center. October 19, 2015. Archived from the original on October 19, 2015. ^ "Prognostic Reasoning for Typhoon 25W (Champi) Warning Nr 27". Joint Typhoon Warning Center. October 19, 2015. Archived from the original on October 20, 2015. ^ "Prognostic Reasoning for Typhoon 25W (Champi) Warning Nr 33". Joint Typhoon Warning Center. October 21, 2015. Archived from the original on October 22, 2015. ^ "Prognostic Reasoning for Typhoon 25W (Champi) Warning Nr 37". Joint Typhoon Warning Center. October 22, 2015. Archived from the original on October 22, 2015. ^ "Prognostic Reasoning for Typhoon 25W (Champi) Warning Nr 40". Joint Typhoon Warning Center. October 23, 2015. Archived from the original on October 23, 2015. ^ "STS 1525 CHAMPI (1525)". Japan Meteorological Agency. October 24, 2015. Archived from the original on October 24, 2015. ^ "Tropical Storm 25W (Champi) Warning Nr 047". Joint Typhoon Warning Center. October 24, 2015. Archived from the original on October 24, 2015. ^ "JMA WWJP25 Warning and Summary October 20, 2015 00z". Japan Meteorological Agency. October 20, 2015. Archived from the original on October 20, 2015. Retrieved October 20, 2015. ^ a b "Significant Tropical Weather Advisory for the Western and South Pacific Oceans October 20, 2015 06z". United States Joint Typhoon Warning Center. Archived from the original on October 20, 2015. Retrieved October 20, 2015. ^ "Tropical Cyclone Formation Alert October 20, 2015 22z". United States Joint Typhoon Warning Center. Archived from the original on October 22, 2015. Retrieved October 20, 2015. ^ "JTWC Prognostic Reasoning For Tropical Depression 26W October 22, 2015 03z". United States Joint Typhoon Warning Center. Archived from the original on July 15, 2016. Retrieved July 15, 2016. ^ "Prognostic Reasoning For Tropical Depression 26W October 22, 2015 15z". United States Joint Typhoon Warning Center. Archived from the original on October 23, 2015. Retrieved October 22, 2015. ^ "Tropical Depression 26W Warning October 22, 2015 21z". United States Joint Typhoon Warning Centre. October 22, 2015. Archived from the original on October 23, 2015. Retrieved November 8, 2015. ^ Annual Tropical Cyclone Report 2015 (PDF) (Report). United States Joint Typhoon Warning Center. Archived from the original (PDF) on August 16, 2016. Retrieved July 11, 2016. ^ a b c d e Typhoon In-fa (RSMC Tropical Cyclone Best Track). Japan Meteorological Agency. January 4, 2016. Archived from the original on August 24, 2016. Retrieved August 24, 2016. ^ "Significant Tropical Weather Advisory for the Western and South Pacific Oceans November 16, 2015 06z". United States Joint Typhoon Warning Center. November 16, 2015. Archived from the original on July 25, 2016. ^ "JTWC 2015 best track analysis: Typhoon 27W: In-fa" (DAT). United States Joint Typhoon Warning Center. Retrieved August 24, 2016. ^ "TS 1526 IN-FA (1526) UPGRADED FROM TD". Japan Meteorological Agency. November 17, 2015. Archived from the original on November 17, 2015. ^ "Prognostic Reasoning for Typhoon 27W (In-fa) Warning Nr 06". Joint Typhoon Warning Center. November 18, 2015. Archived from the original on November 18, 2015. ^ "Prognostic Reasoning for Tropical Storm 27W (In-fa) Warning Nr 08". Joint Typhoon Warning Center. November 18, 2015. Archived from the original on November 20, 2015. ^ "TS 1526 IN-FA (1526) DOWNGRADED FROM STS". Japan Meteorological Agency. November 19, 2015. Archived from the original on November 20, 2015. ^ "Prognostic Reasoning for Typhoon 27W (In-fa) Warning Nr 11". Joint Typhoon Warning Center. November 19, 2015. Archived from the original on November 20, 2015. ^ "Prognostic Reasoning for Typhoon 27W (In-fa) Warning Nr 17". Joint Typhoon Warning Center. November 21, 2015. Archived from the original on November 21, 2015. ^ "Prognostic Reasoning for Typhoon 27W (In-fa) Warning Nr 20". Joint Typhoon Warning Center. November 21, 2015. Archived from the original on November 22, 2015. ^ "Pagasa: Typhoon 'Marilyn' enters PAR". Inquirer.net. November 22, 2015. ^ "Prognostic Reasoning for Typhoon 27W (In-fa) Warning Nr 23". Joint Typhoon Warning Center. November 22, 2015. Archived from the original on November 22, 2015. ^ "Prognostic Reasoning for Typhoon 27W (In-fa) Warning Nr 28". Joint Typhoon Warning Center. November 23, 2015. Archived from the original on November 26, 2015. ^ "Prognostic Reasoning for Tropical Storm 27W (In-fa) Warning Nr 32". Joint Typhoon Warning Center. November 24, 2015. Archived from the original on November 26, 2015. ^ "Tropical Storm 27W (In-fa) Warning Nr 037". United States Joint Typhoon Warning Center. November 26, 2015. Archived from the original on November 26, 2015. Retrieved September 13, 2016. ^ Bancroft, George P (2016). Rychta, Paula M (ed.). Marine Weather Review - North Pacific Area September to December 2015 (PDF) (Mariners Weather Log: Volume 60: Issue 2: August 2016). United States National Oceanic and Atmospheric Administration. pp. 39–55. ISSN 0025-3367. Archived (PDF) from the original on September 13, 2016. Retrieved September 13, 2016. ^ a b Typhoon Melor (RSMC Tropical Cyclone Best Track). Japan Meteorological Agency. January 21, 2016. Archived from the original on January 21, 2016. Retrieved July 9, 2016. ^ "TS 1527 MELOR (1527) UPGRADED FROM TD". Japan Meteorological Agency. December 11, 2015. Archived from the original on December 11, 2015. ^ "Prognostic Reasoning for Tropical Storm 28W (Melor) Warning Nr 02". Joint Typhoon Warning Center. Archived from the original on December 13, 2015. Retrieved December 18, 2015. ^ "SEVERE WEATHER BULLETIN #1 TROPICAL STORM "NONA"". PAGASA. December 11, 2015. Archived from the original on December 13, 2015. ^ "Prognostic Reasoning for Tropical Storm 28W (Melor) Warning Nr 05". Joint Typhoon Warning Center. December 12, 2015. Archived from the original on December 13, 2015. ^ "STS 1527 MELOR (1527) UPGRADED FROM TS". Japan Meteorological Agency. December 12, 2015. Archived from the original on December 13, 2015. ^ "TY 1527 MELOR (1527) UPGRADED FROM STS". Japan Meteorological Agency. December 13, 2015. Archived from the original on December 13, 2015. ^ "Prognostic Reasoning for Typhoon 28W (Melor) Warning Nr 08". Joint Typhoon Warning Center. December 13, 2015. Archived from the original on December 13, 2015. ^ "Prognostic Reasoning for Typhoon 28W (Melor) Warning Nr 10". Joint Typhoon Warning Center. December 13, 2015. Archived from the original on December 14, 2015. ^ "Prognostic Reasoning for Typhoon 28W (Melor) Warning Nr 19". Joint Typhoon Warning Center. December 16, 2015. Archived from the original on December 17, 2015. ^ "TD DOWNGRADED FROM TS 1527 MELOR (1527)". Japan Meteorological Agency. December 17, 2015. Archived from the original on December 17, 2015. ^ "SitRep No.19 re Preparedness Measures and Effects of Typhoon NONA (I.N. MELOR)" (PDF). December 24, 2015. Retrieved December 25, 2015. ^ Virona, Madonna (December 16, 2015). "Oriental Mindoro under state of calamity". Inquirer.net. Inquirer Southern Luzon. Philippine Daily Inquirer. Retrieved December 19, 2015. ^ "Typhoon Nona turns Pinamalayan town in Oriental Mindoro into wasteland". GMA News Online. GMA News. December 18, 2015. Retrieved December 18, 2015. ^ Alvarez, Kathrina Charmaine (December 18, 2015). "PNoy declares state of national calamity due to Nona". GMA News Online. Retrieved December 18, 2015. ^ "Tropical Depression 29W (Twenty-nine) Warning Nr 001". Joint Typhoon Warning Center. December 16, 2015. Archived from the original on December 17, 2015. ^ "Tropical Depression Onyok now in PAR". Gmanetwork.com. Retrieved July 9, 2016. ^ "Prognostic Reasoning for Tropical Depression 29W (Twenty-nine) Warning Nr 03". Joint Typhoon Warning Center. December 17, 2015. Archived from the original on December 17, 2015. ^ "Tropical Depression 29W (Twenty-nine) Warning Nr 006". Joint Typhoon Warning Center. December 18, 2015. Archived from the original on December 18, 2015. ^ "Onyok makes landfall over Davao Oriental". Rappler. December 18, 2015. ^ a b "FINAL_REPORT_re_Tropical_Depression_ONYOK" (PDF). July 4, 2016. ^ "JMA WWJP25 Warning and Summary January 2, 2015 06z". Japan Meteorological Agency. January 2, 2015. Archived from the original on January 2, 2015. Retrieved January 2, 2015. ^ "Significant Tropical Weather Advisory for the Western and South Pacific Oceans January 2, 2015 01z". Joint Typhoon Warning Center. Archived from the original on January 2, 2015. Retrieved January 2, 2015. ^ "Tropical Cyclone Formation Alert Cancellation January 3, 2015 06z". Joint Typhoon Warning Center. Archived from the original on January 5, 2015. Retrieved January 5, 2015. ^ "Significant Tropical Weather Advisory for the Western and South Pacific Oceans January 4, 2015 06z". Joint Typhoon Warning Center. Archived from the original on January 5, 2015. Retrieved January 2, 2015. ^ "JMA WWJP25 Warning and Summary January 4, 2015 06z". Japan Meteorological Agency. January 4, 2015. Archived from the original on January 4, 2015. Retrieved January 5, 2015. ^ "JMA WWJP25 Warning and Summary January 4, 2015 12z". Japan Meteorological Agency. January 4, 2015. Archived from the original on January 5, 2015. Retrieved January 5, 2015. ^ "Tropical Storm Loke Discussion Number 24". United States Central Pacific Hurricane Center. August 26, 2015. Retrieved July 5, 2016. ^ "JMA WWJP25 Warning and Summary October 7, 2015 00z". Japan Meteorological Agency. October 7, 2015. Archived from the original on October 8, 2015. Retrieved November 15, 2015. ^ "JMA WWJP25 Warning and Summary October 8, 2015 06z". Japan Meteorological Agency. October 8, 2015. Archived from the original on October 8, 2015. Retrieved November 15, 2015. ^ "JMA WWJP25 Warning and Summary October 19, 2015 18z". Japan Meteorological Agency. October 19, 2015. Archived from the original on October 20, 2015. Retrieved November 15, 2015. ^ "Significant Tropical Weather Advisory for the Western and South Pacific Oceans October 19, 2015 13z". Joint Typhoon Warning Center. Archived from the original on October 19, 2015. Retrieved November 15, 2015. ^ "Significant Tropical Weather Advisory for the Western and South Pacific Oceans October 20, 2015 23z". Joint Typhoon Warning Center. Archived from the original on July 25, 2016. ^ "JMA WWJP25 Warning and Summary October 22, 2015 06z". Japan Meteorological Agency. October 22, 2015. Archived from the original on October 22, 2015. Retrieved November 15, 2015. ^ "JMA WWJP25 Warning and Summary December 20, 2015 06z". Japan Meteorological Agency. December 20, 2015. Archived from the original on December 23, 2015. ^ "JMA WWJP25 Warning and Summary December 21, 2015 00z". Japan Meteorological Agency. December 21, 2015. Archived from the original on December 23, 2015. ^ "JMA WWJP25 Warning and Summary December 23, 2015 00z". Japan Meteorological Agency. December 23, 2015. Archived from the original on December 23, 2015. ^ a b Zhou, Xiao; Lei, Xiaotu (2012). "Summary of retired typhoons within the Western North Pacific Ocean". Tropical Cyclone Research and Review. 1 (1): 23–32. doi:10.6057/2012TCRR01.03. ISSN 2225-6032. Retrieved December 21, 2014. ^ Forty – Eighth Session of Typhoon Committee Session Report (PDF) (Report). The Economic and Social Commission for Asia and the Pacific/World Meteorological Organization's Typhoon Committee. 2016. p. 1. Retrieved May 3, 2016. ^ a b c "Philippine Tropical Cyclone Names". Philippine Atmospheric, Geophysical and Astronomical Services Administration. Archived from the original on December 28, 2016. Retrieved April 18, 2015. ^ Patricia Lourdes Viray. "PHL ends 2015 with less typhoons; to decommission 2 killer cyclones". The Philippine Star. Archived from the original on March 17, 2016. Retrieved December 22, 2015. ^ "Tropical storm enters PAR, named 'Nona' instead of 'Nonoy'". Sun Star. Manila, Philippines. December 12, 2015. Retrieved December 12, 2015. ^ "Severe Weather Bulletin #1 – Tropical Cyclone Alert: Tropical Storm "Nona"". Philippine Atmospheric, Geophysical and Astronomical Services Administration. December 11, 2015. Archived from the original on December 22, 2015. Retrieved December 11, 2015. ^ a b "PAGASA replaces Tropical Cyclone "Lando" TO "Liwayway"" (Press release). Philippine Atmospheric, Geophysical and Astronomical Services Administration. February 5, 2015. Archived from the original on November 4, 2015. Retrieved November 4, 2015. ^ "SitRep No. 10 re Effects of Tropical Storm "Amang" (MEKKHALA)" (PDF). National Disaster Risk Reduction and Management Council. Retrieved January 20, 2015. ^ Final Report: re Preparedness Measures and Effects for Typhoon DODONG (NOUL) (PDF) (Report). National Disaster Risk Reduction and Management Council. May 13, 2015. Retrieved May 13, 2015. ^ Ken Quintanilla (June 8, 2015). "Major disaster declaration covers public assistance for Guam". KUAM News. Retrieved June 9, 2015. ^ "Typhoon Kujira affects 193,000 in Hainan". Beijing, China: English.news.cn. Xinhua General News. June 24, 2015. Retrieved June 30, 2015. ^ "Typhoon Chan-hom Kills 1, Destroys Dozens of Homes in China". The Weather Channel. Retrieved July 12, 2015. ^ "More than 1 million people evacuated as Typhoon Chan-hom smashes into eastern China with waves bigger than six-storey buildings while Killing 5 in the Philippines". Mail Online. July 12, 2015. Retrieved July 14, 2015. ^ FINAL Report re Severe Tropical Storm EGAY (LINFA) (PDF) (Report). National Disaster Risk Reduction and Management Council. July 9, 2015. Retrieved July 9, 2015. ^ "2 Dead, 35 Injured in Japan Amid Nangka Typhoon". Sputniknews. July 17, 2015. ^ "台風１２号、キビ被害１億５４００万　南北大東". Ryūkyū Shimpō (in Japanese). July 28, 2015. Retrieved July 29, 2015. ^ "Typhoon Soudelor highlights protection gap, Goni & Atsani line up". Artemis. Artemis. August 17, 2015. Retrieved September 3, 2015. ^ 蘇迪勒颱風災害應變處置報告第 2 報 (PDF) (in Chinese). Central Emergency Operation Center. August 7, 2015. Retrieved August 7, 2015. ^ a b "Member Report: China" (PDF). CMA. China Meterelogical Agency. Retrieved October 26, 2015. ^ "SitRep No.23 re Preparedness Measures and Effects of Typhoon "INENG" (GONI)" (PDF). NDRRMC. Retrieved September 8, 2015. ^ "Typhoon Goni kills 40, affects 11,000 in N. Korea". The Korea Times. August 26, 2015. ^ "東日本豪雨　千葉県の農林水産業被害額８４００万円　８カ所でがけ崩れ". 産経新聞 (in Japanese). Yahoo! News. September 12, 2015. Archived from the original on September 13, 2015. Retrieved September 13, 2015. ^ "Typhoon Dujuan leaves 3 dead, more than 340 injured in Taiwan". Channel News Asia. September 29, 2015. ^ "SitRep No.13 re Preparedness Measures and Effects of TS KABAYAN (MUJIGAE)" (PDF). NDRRMC. October 10, 2015. Retrieved October 10, 2015. ^ "Kabayan leaves 2 dead, 31 missing". PhilStar. Retrieved October 5, 2015. ^ "FINAL_REPORT_re_Preparedness_Measures_and_Effects_of_Typhoon_LANDO" (PDF). July 5, 2016. ^ "FINAL_REPORT_re_Effects_of_Typhoon_NONA" (PDF). July 5, 2016. 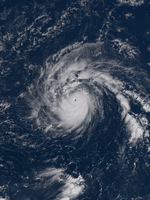 Wikimedia Commons has media related to 2015 Pacific typhoon season.